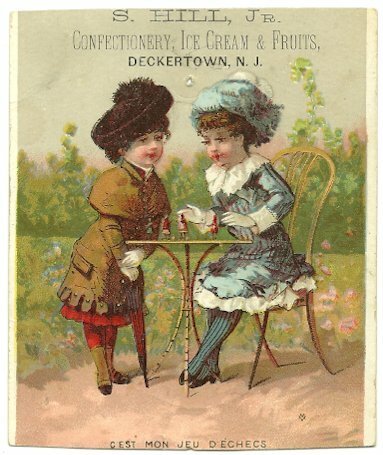 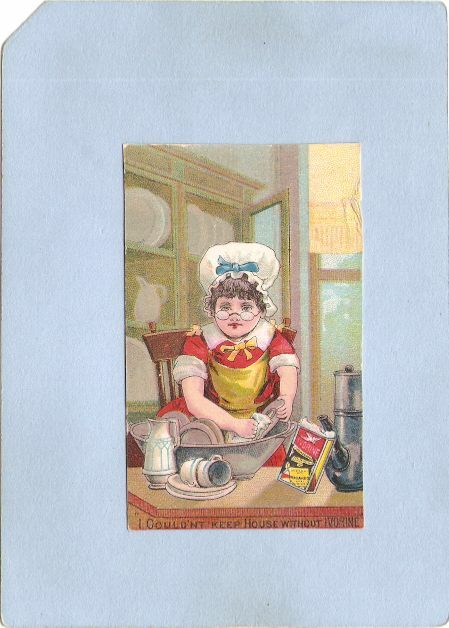 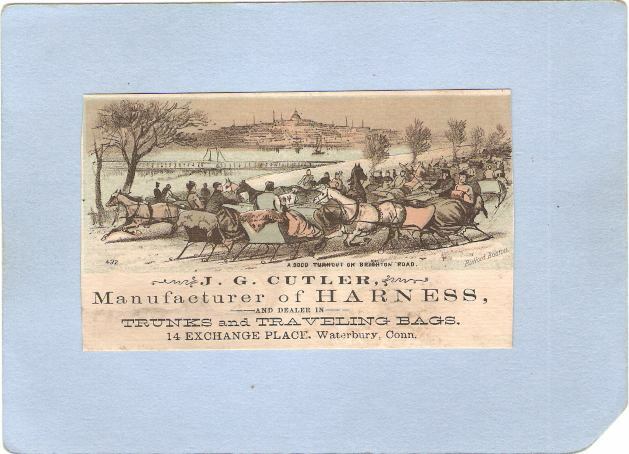 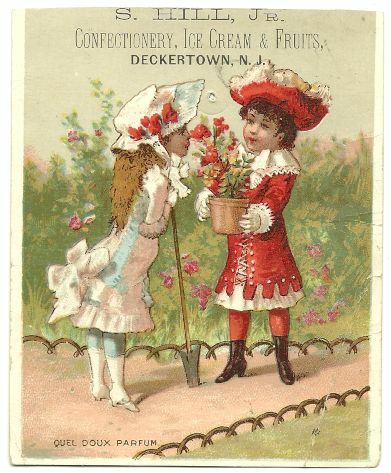 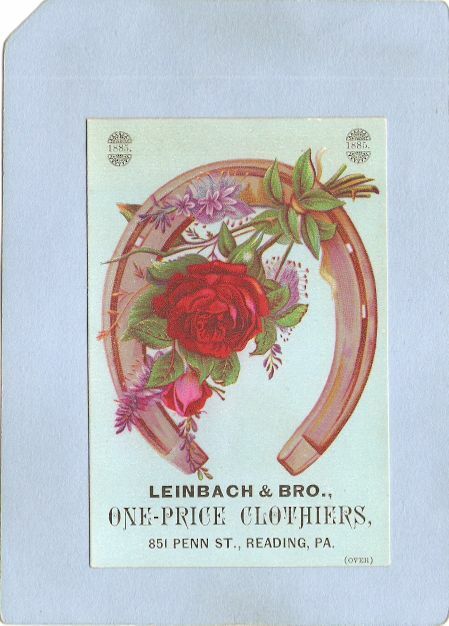 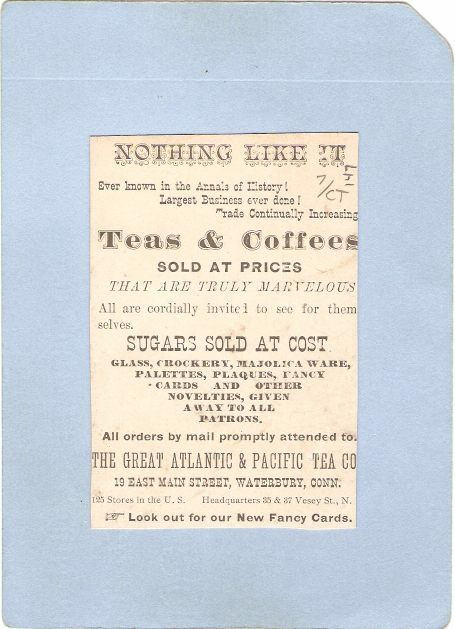 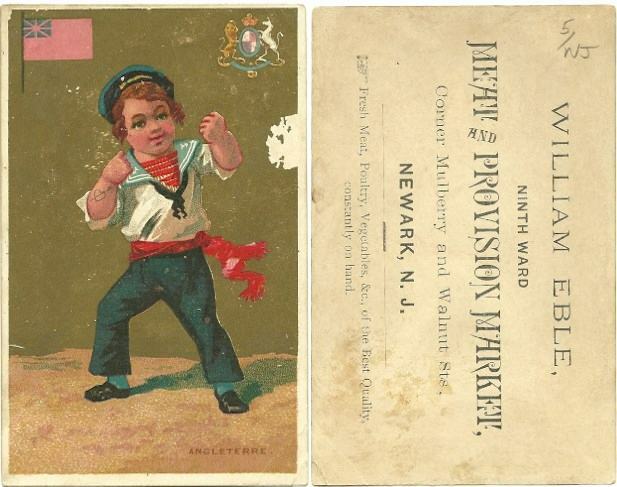 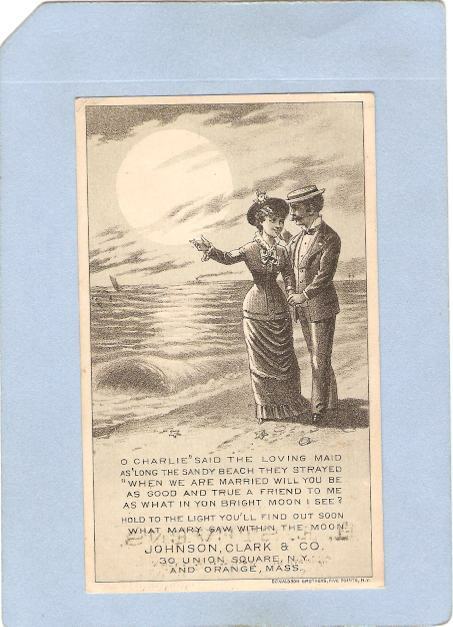 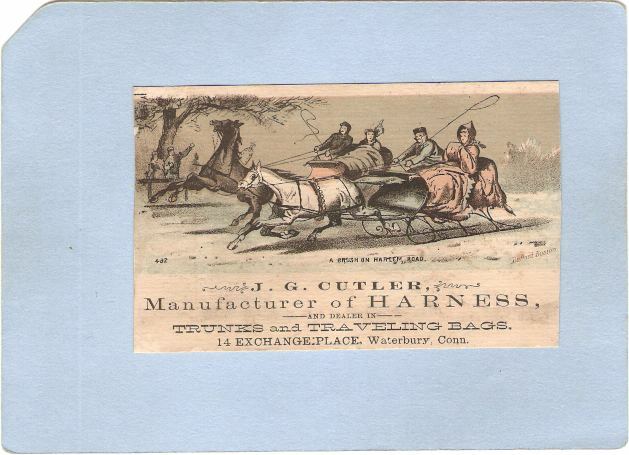 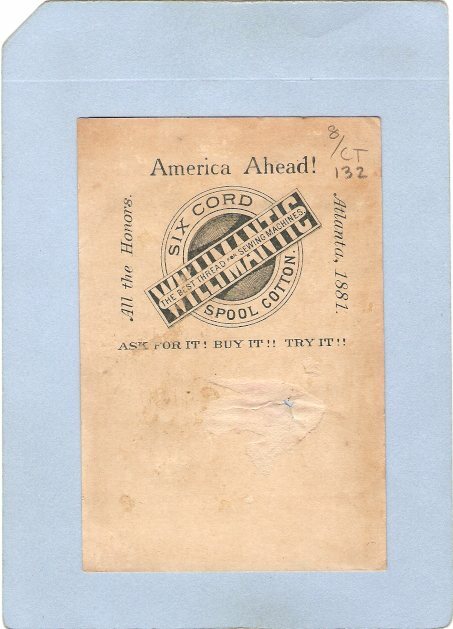 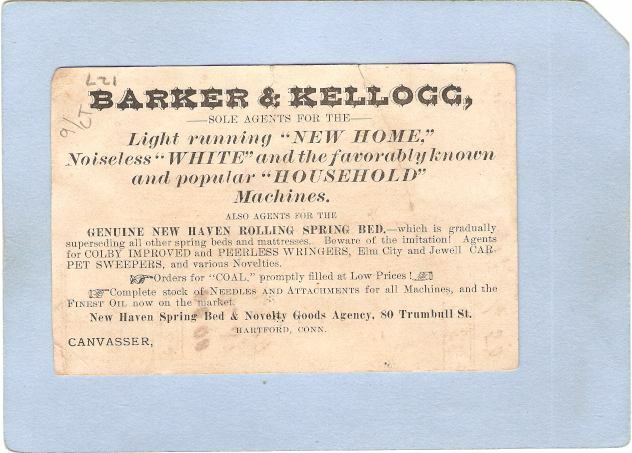 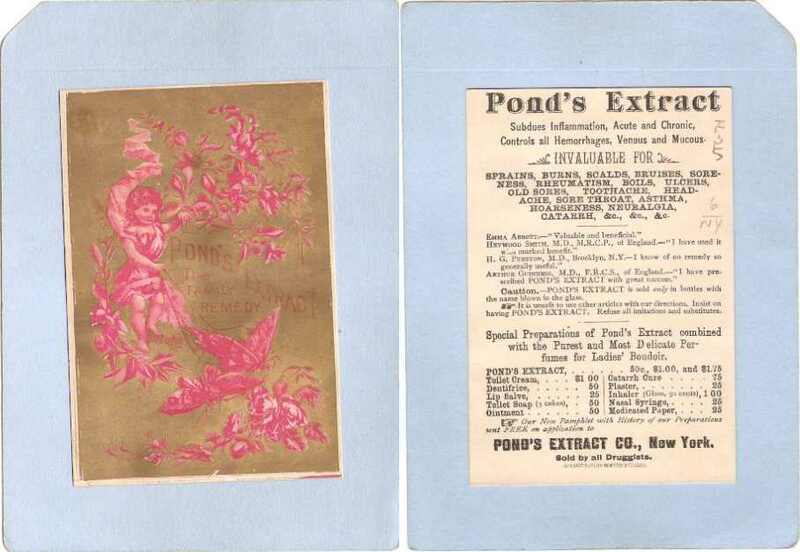 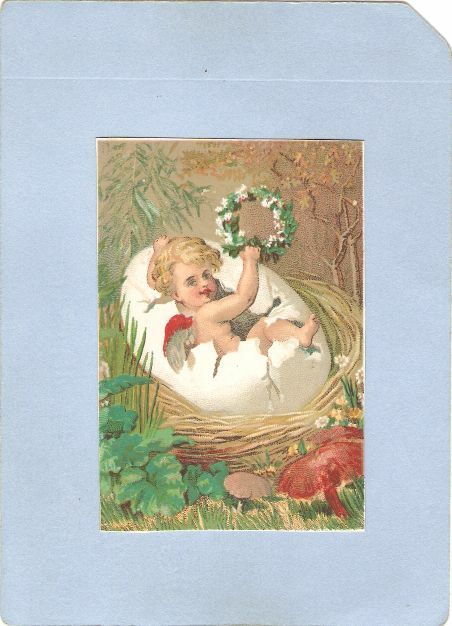 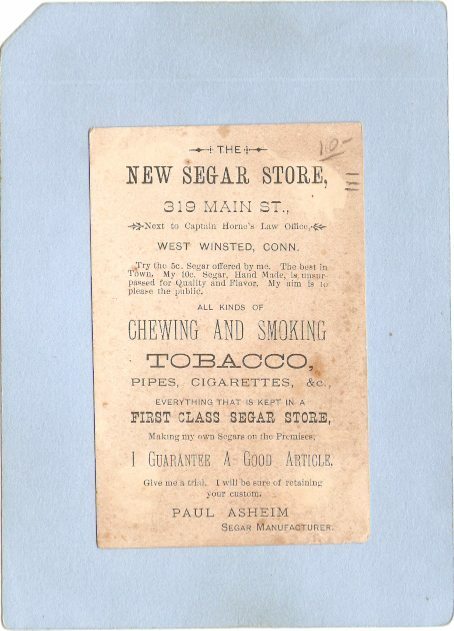 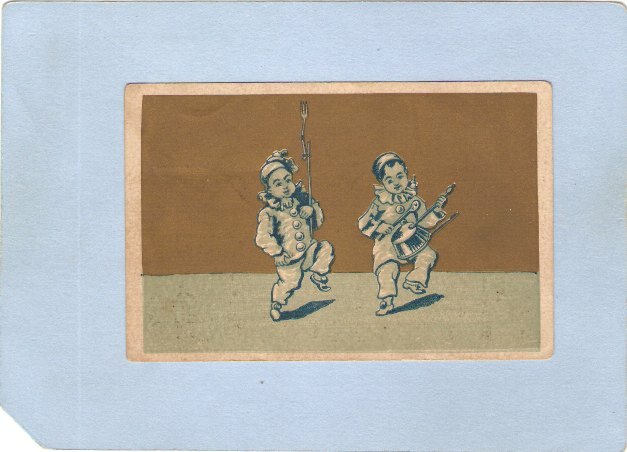 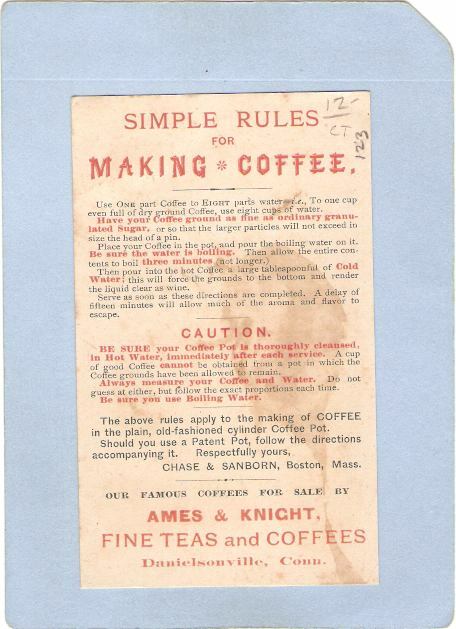 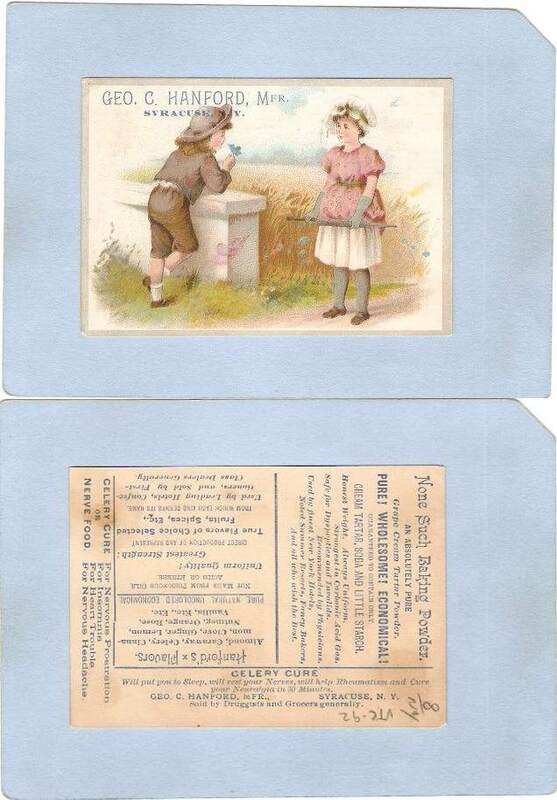 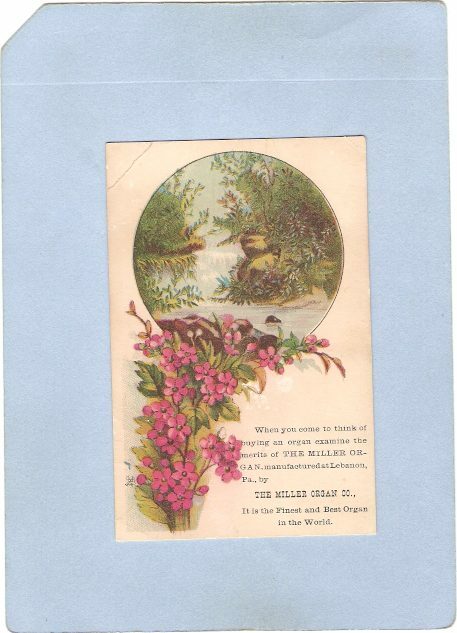 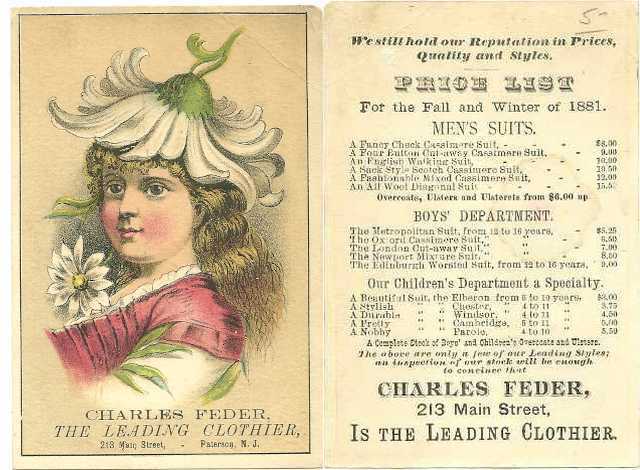 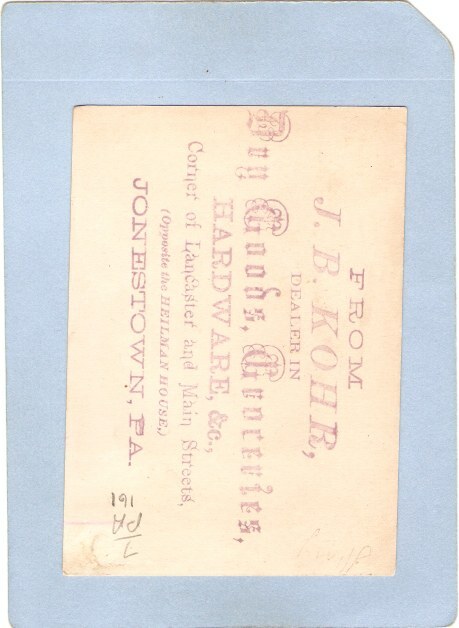 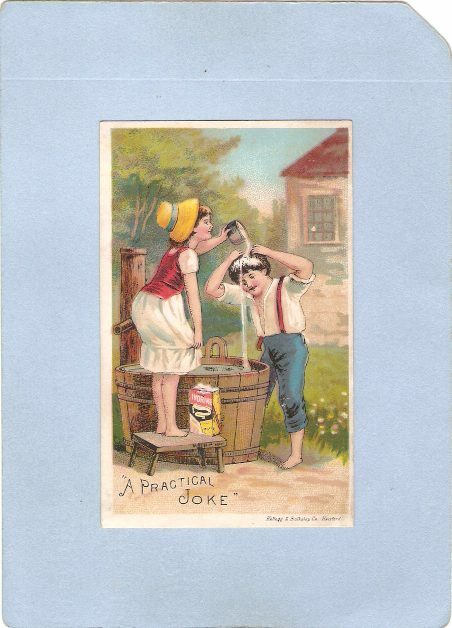 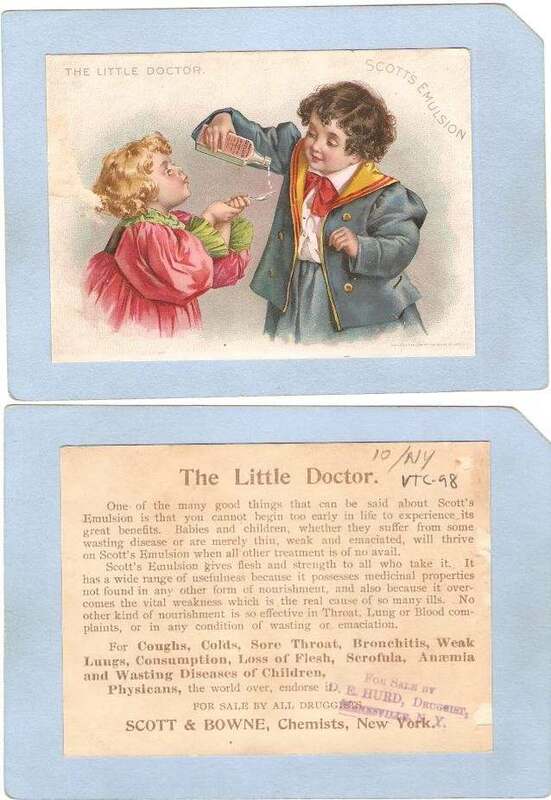 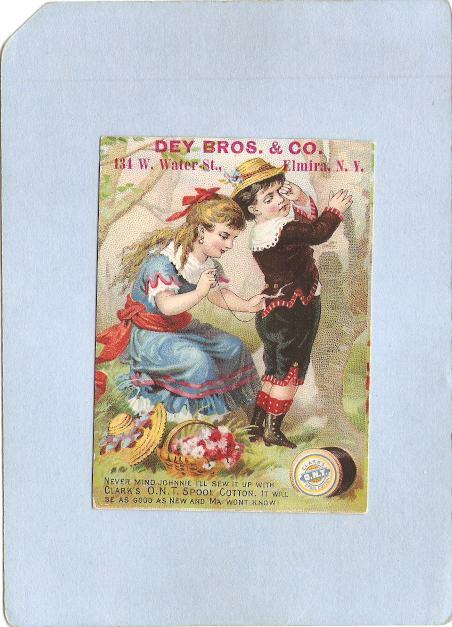 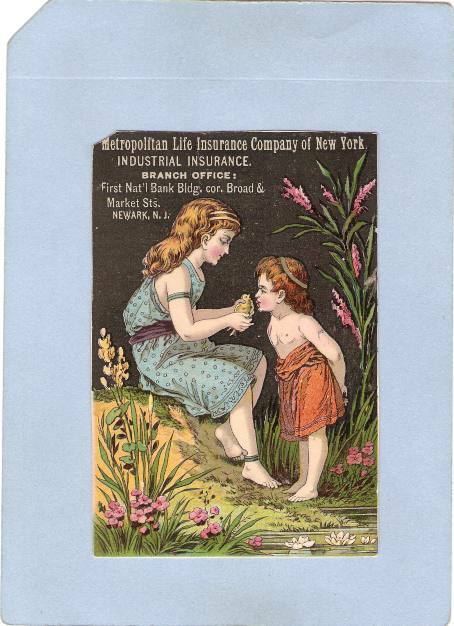 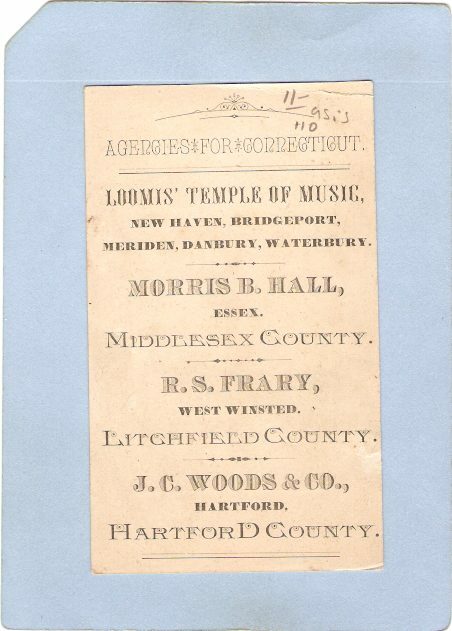 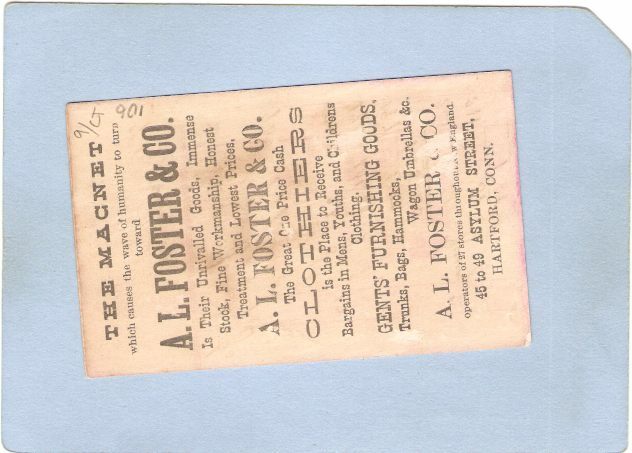 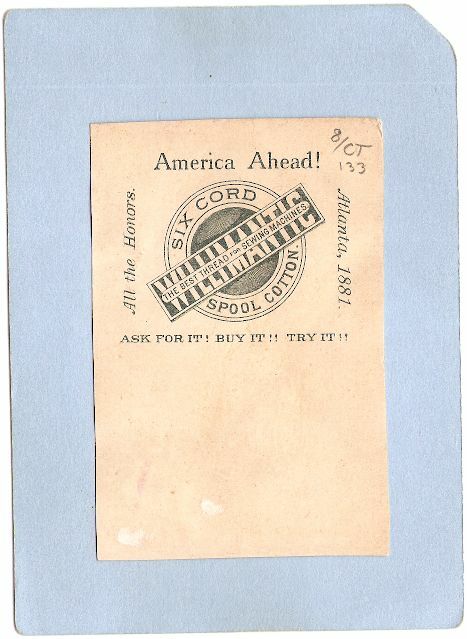 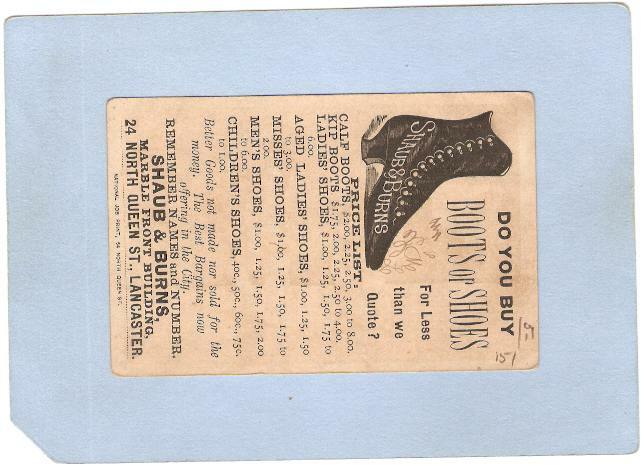 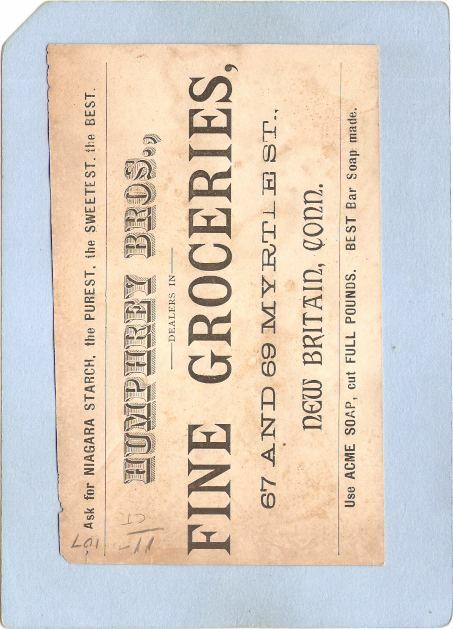 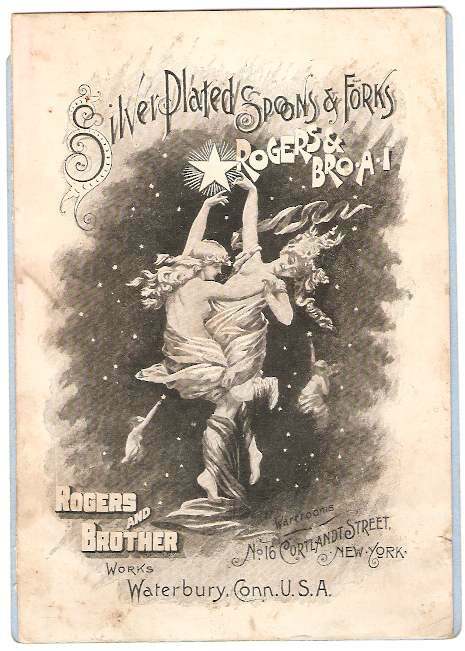 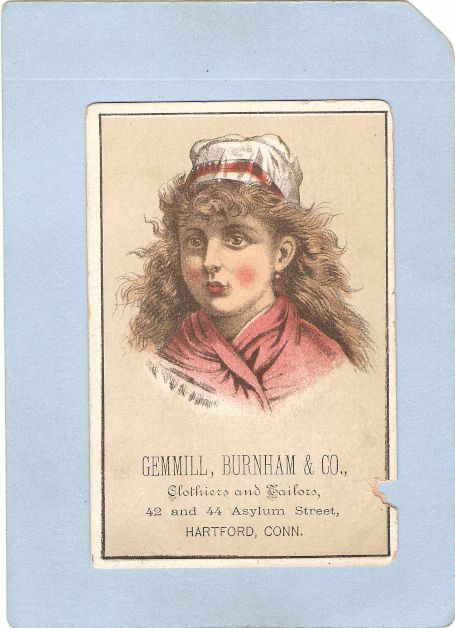 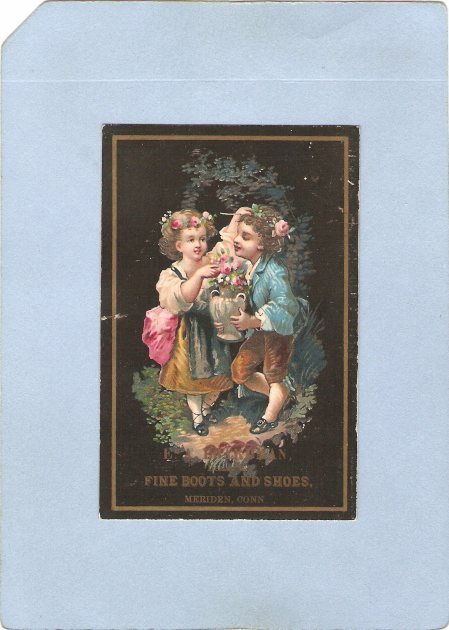 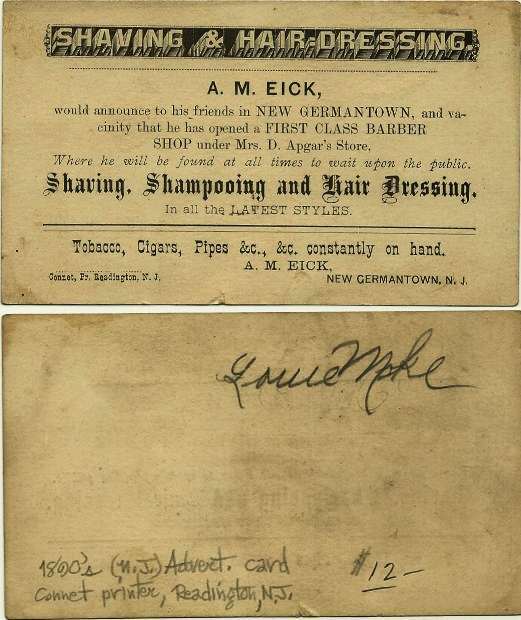 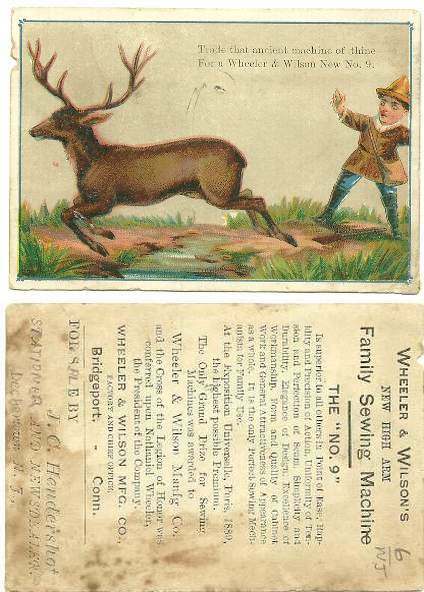 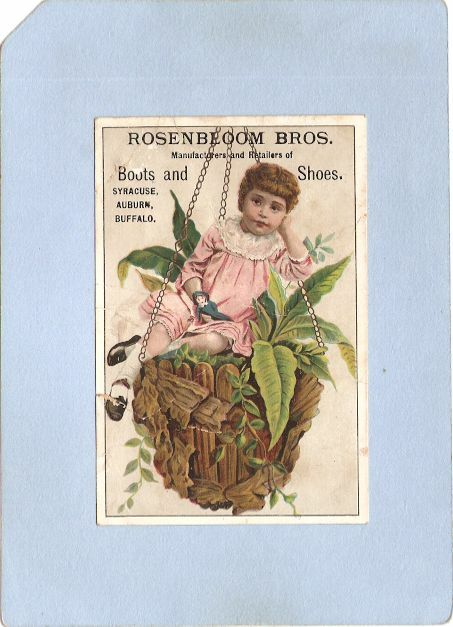 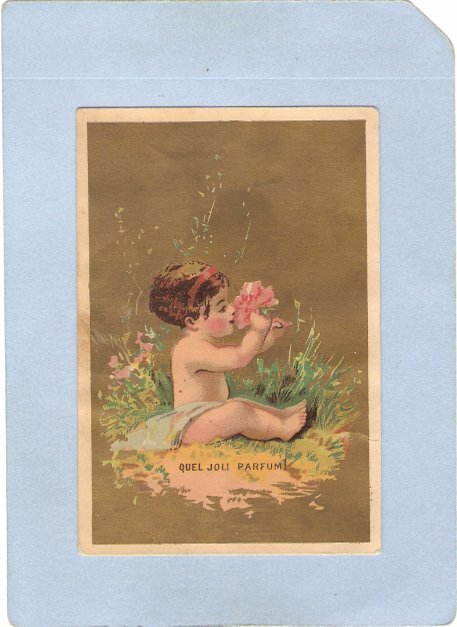 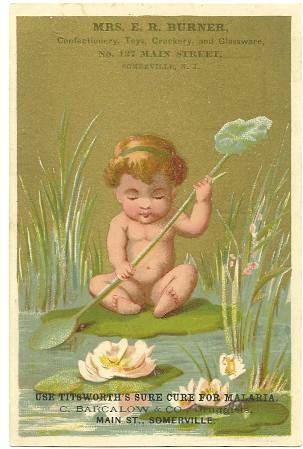 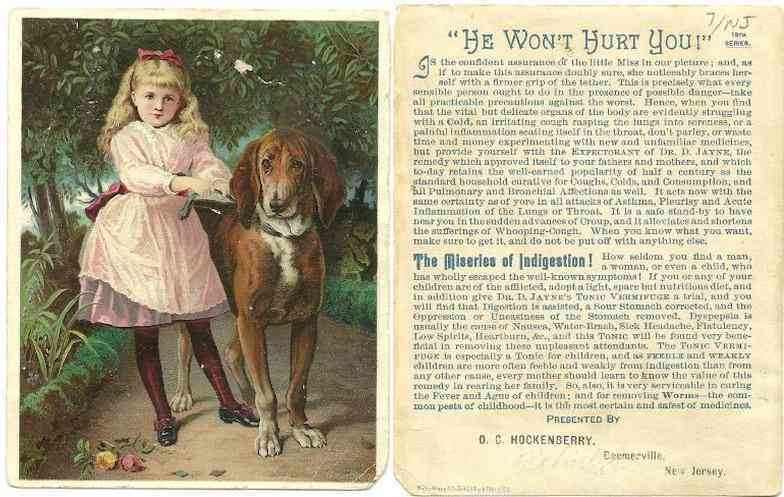 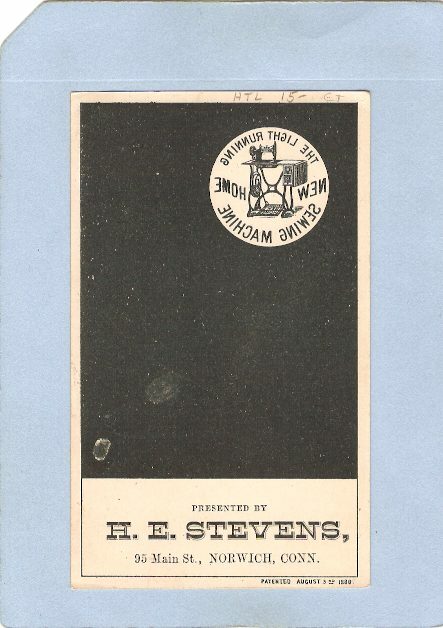 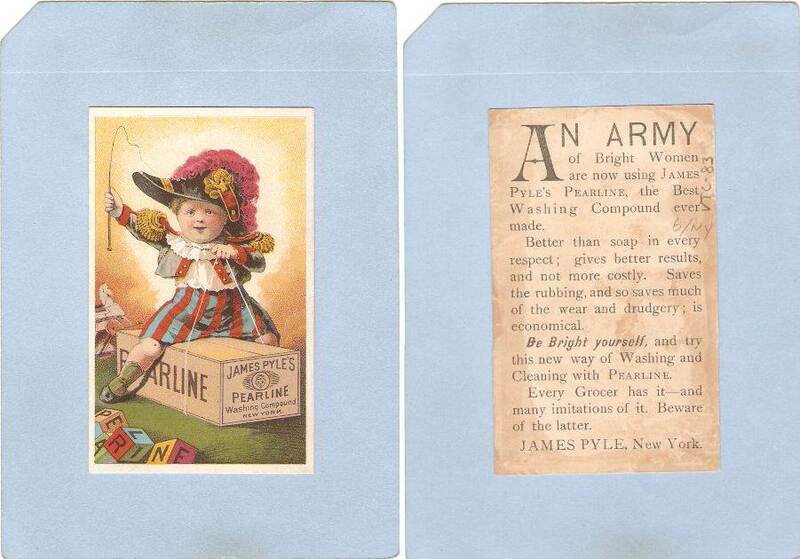 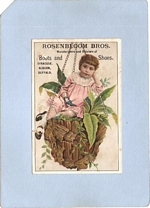 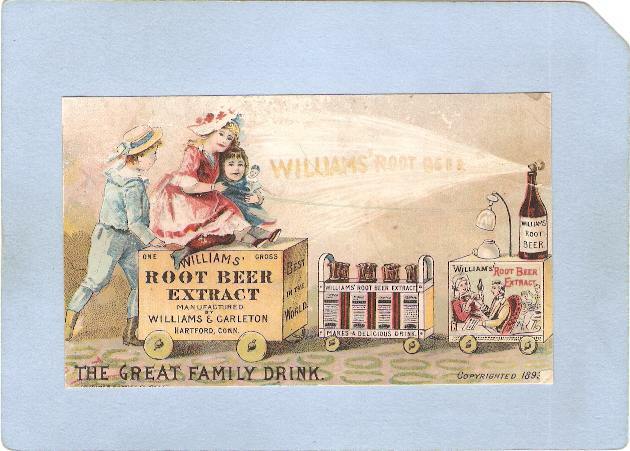 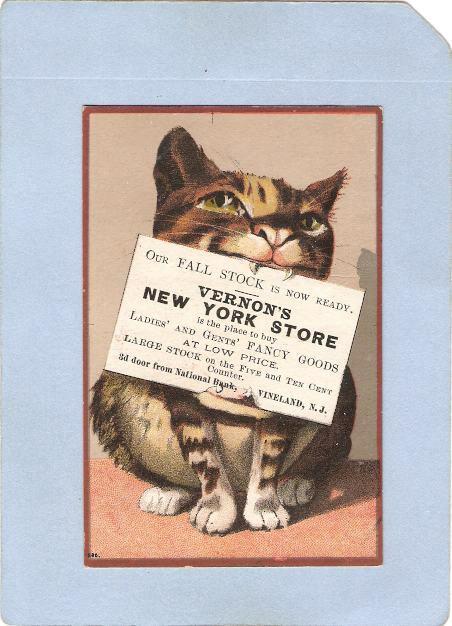 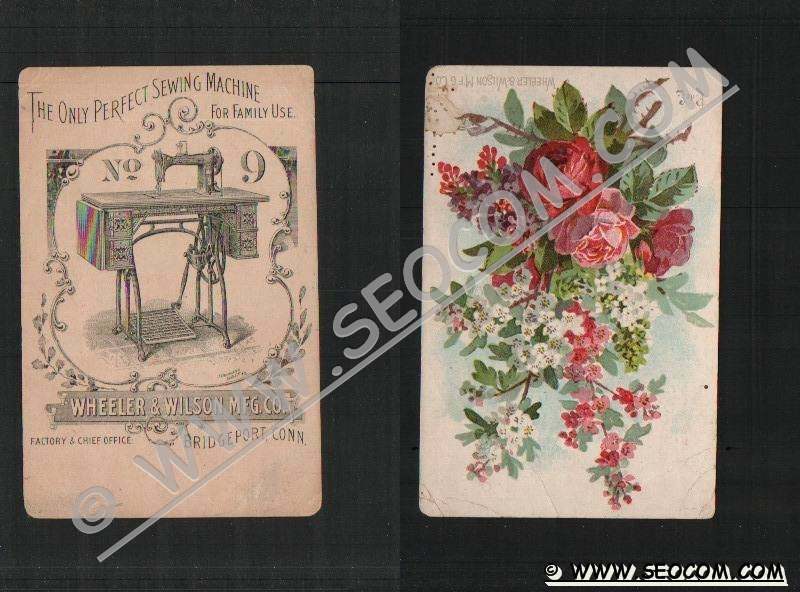 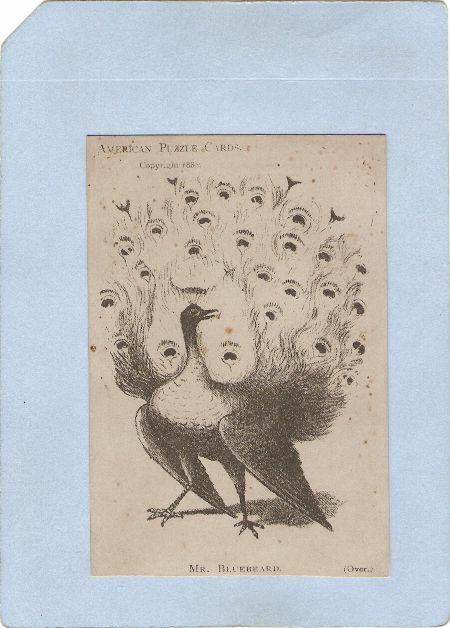 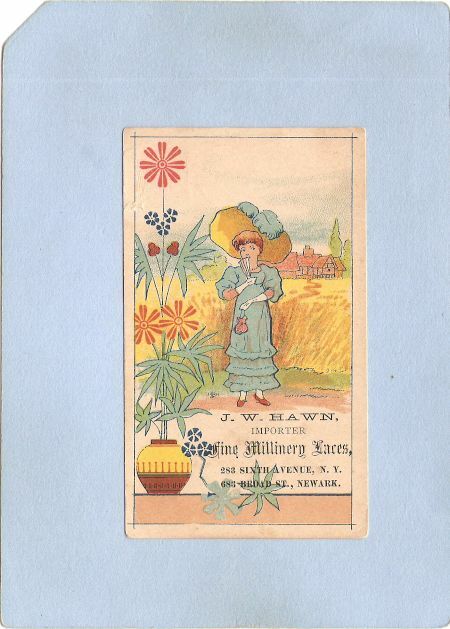 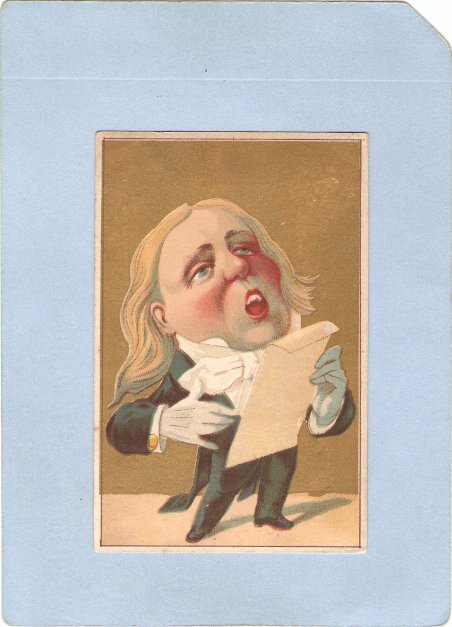 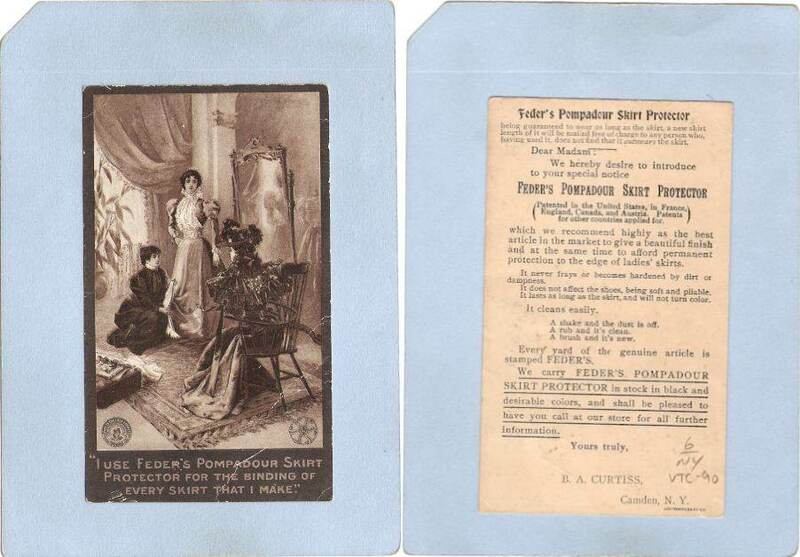 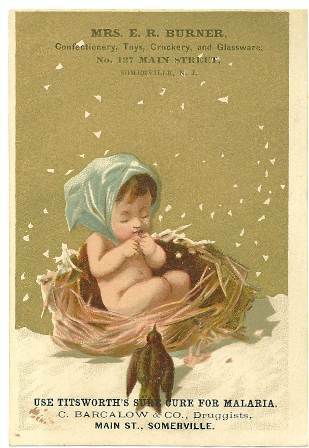 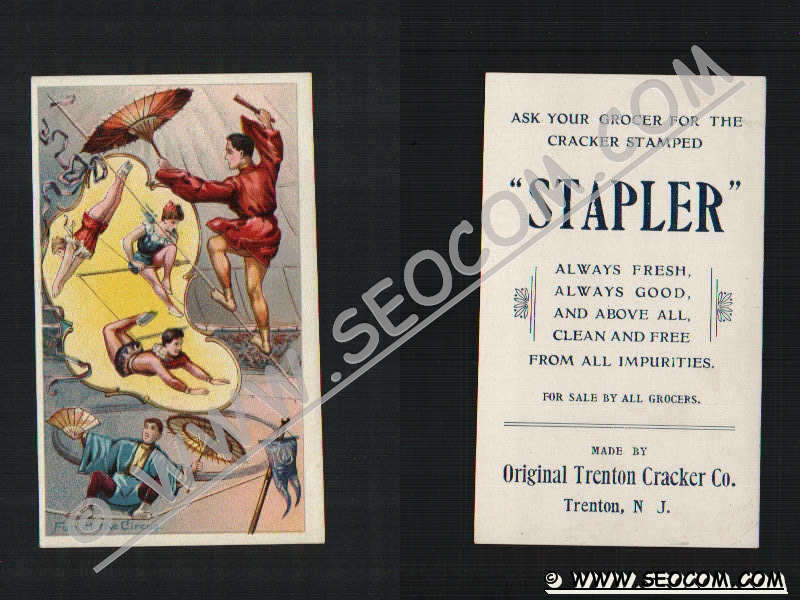 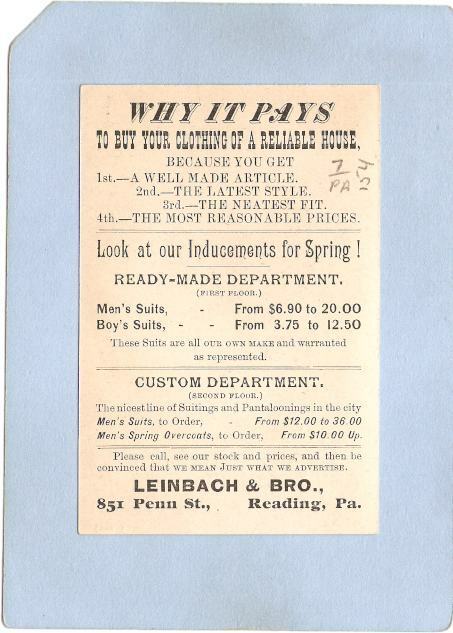 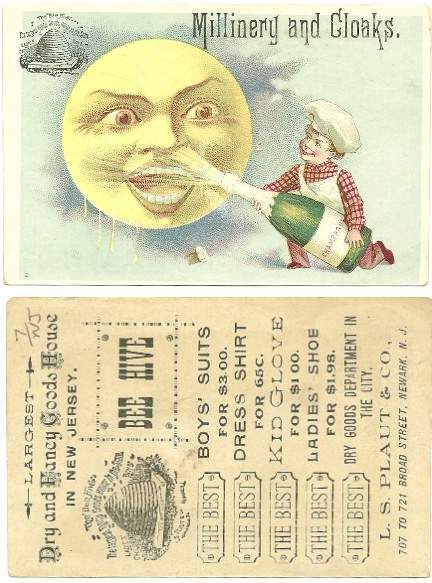 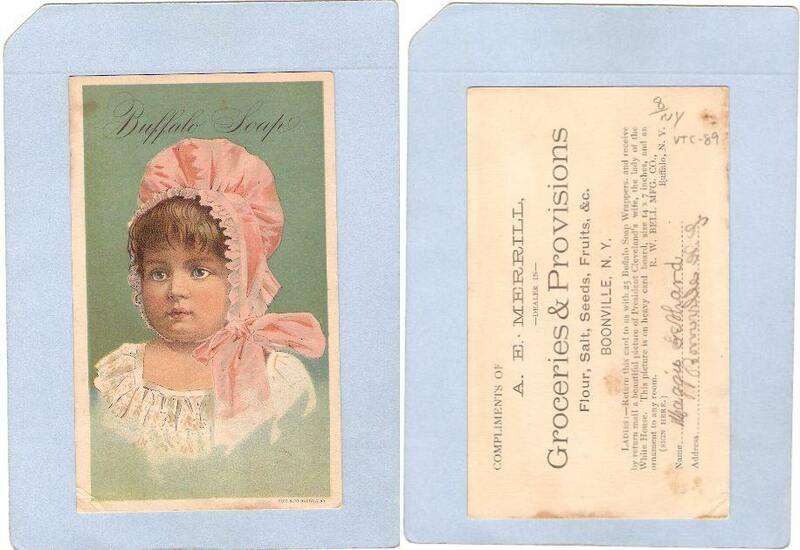 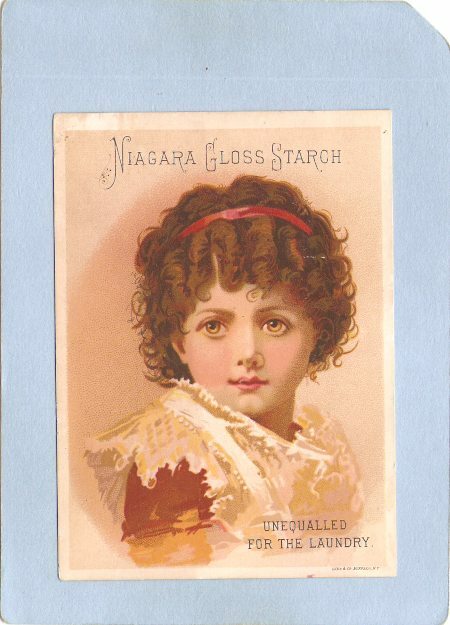 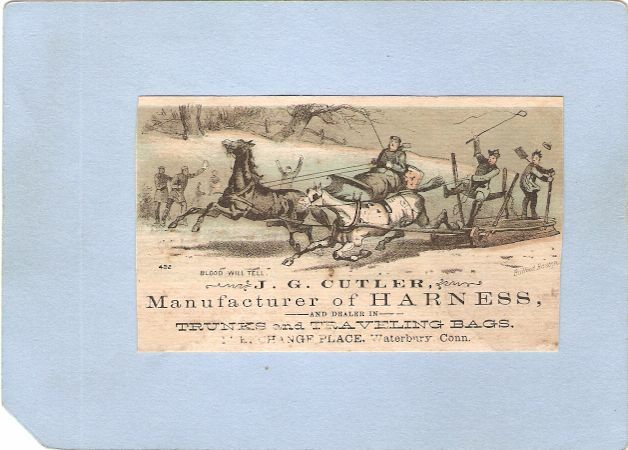 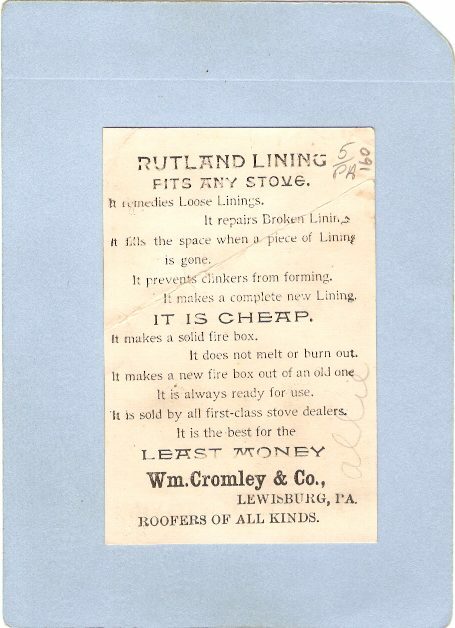 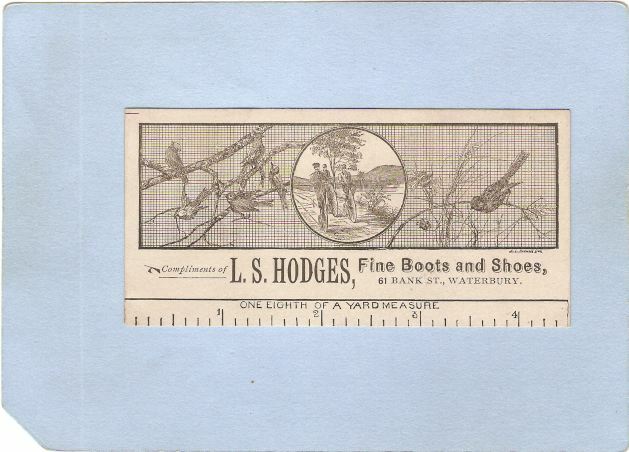 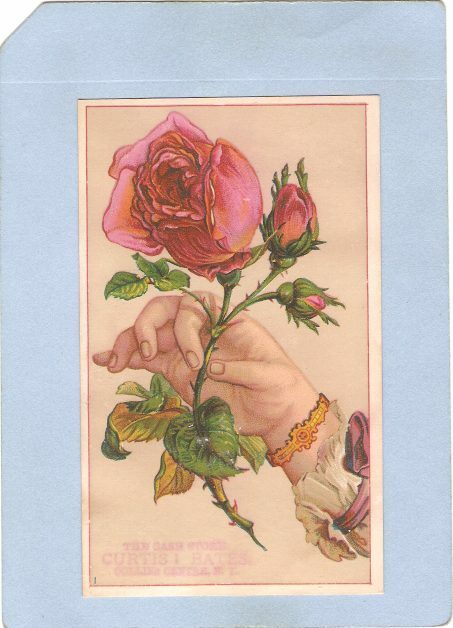 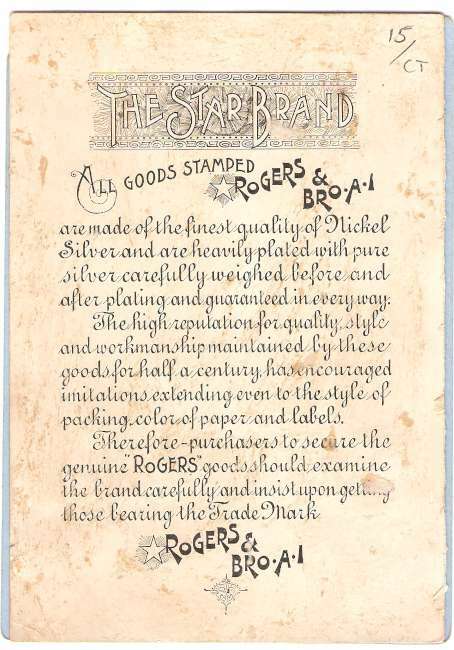 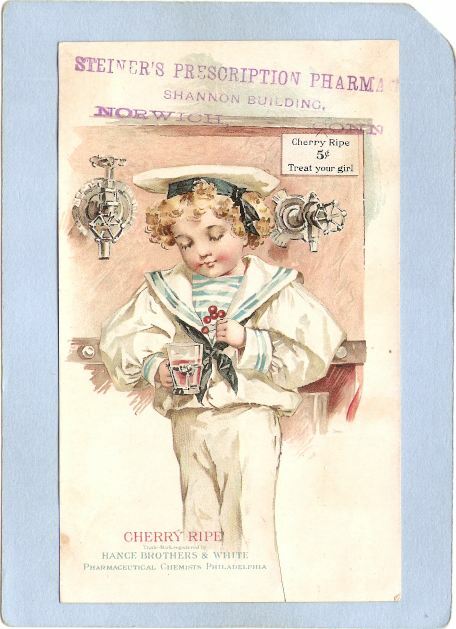 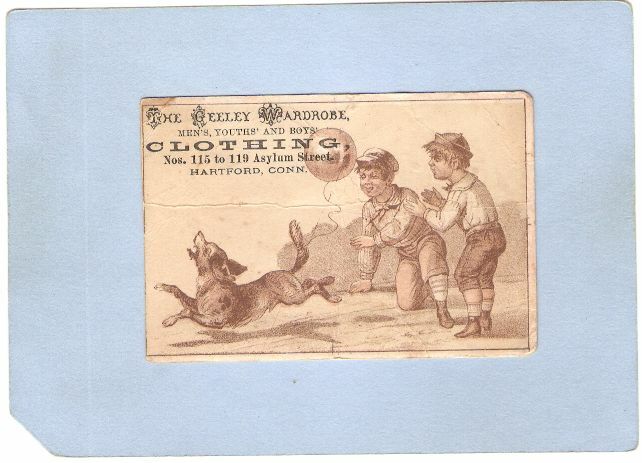 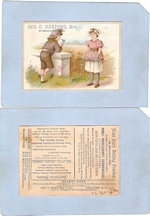 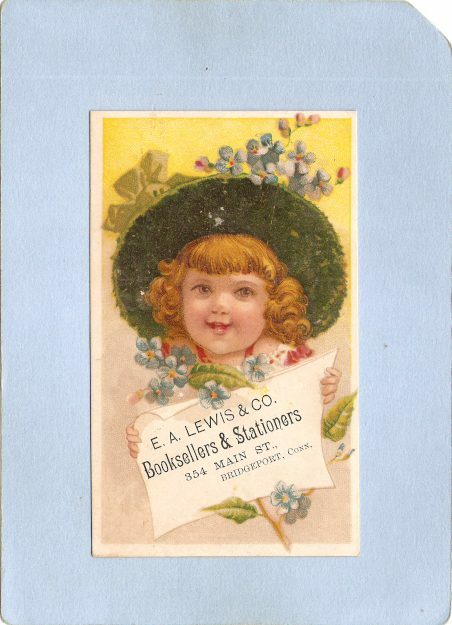 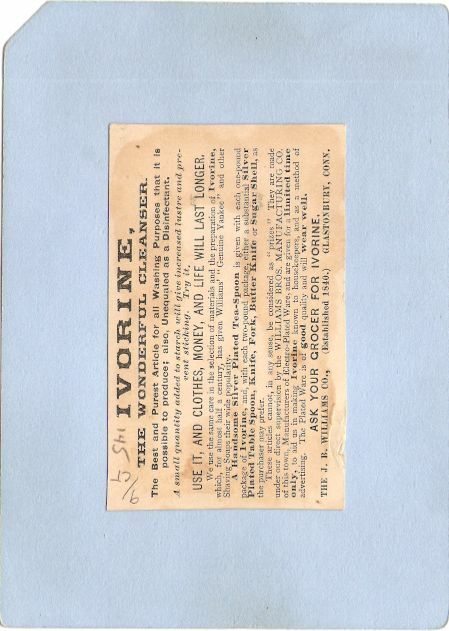 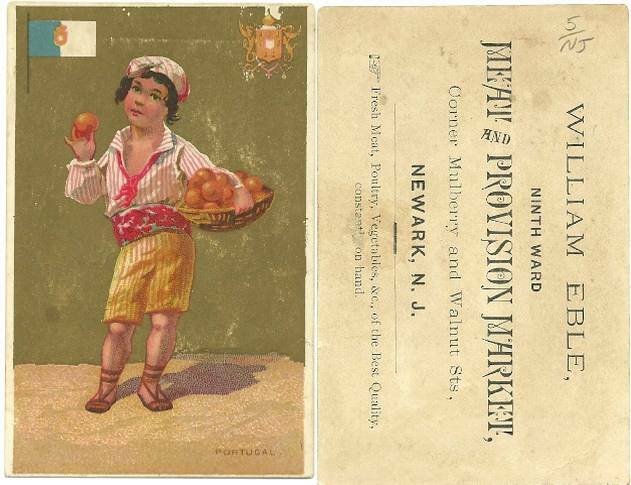 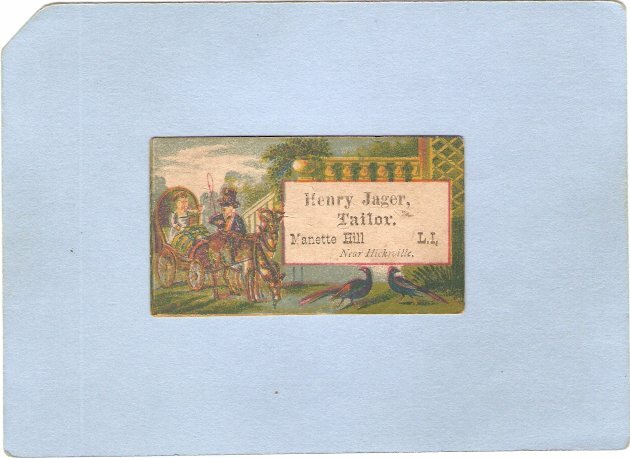 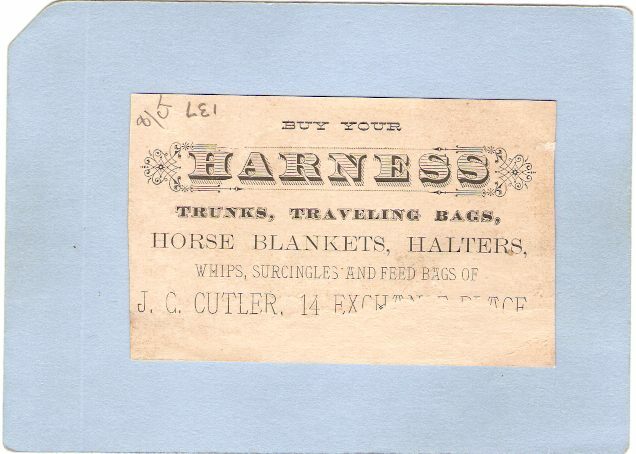 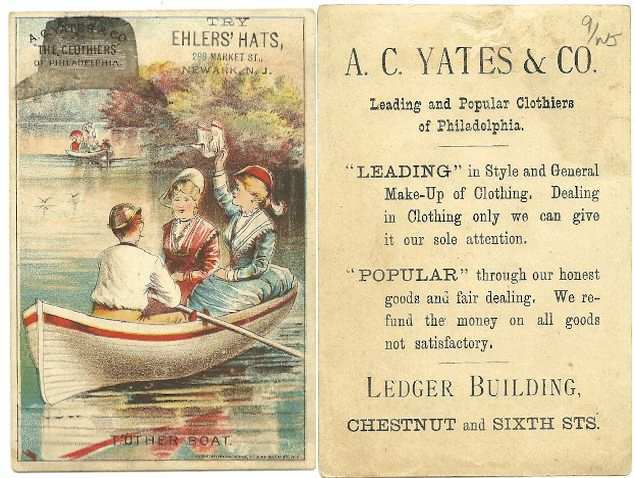 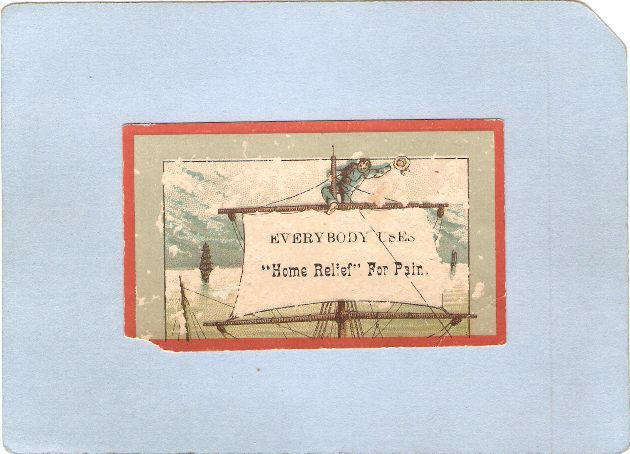 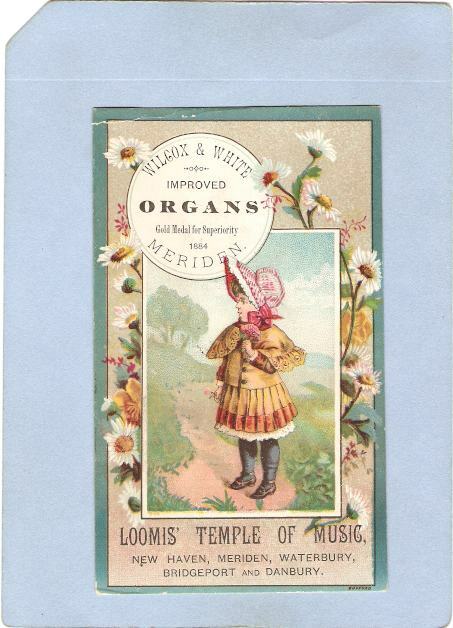 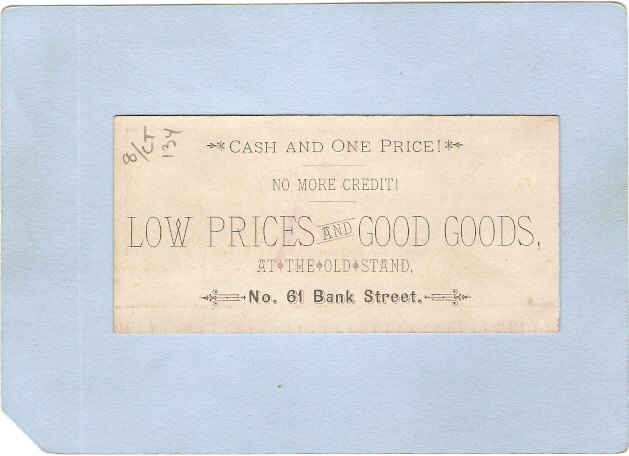 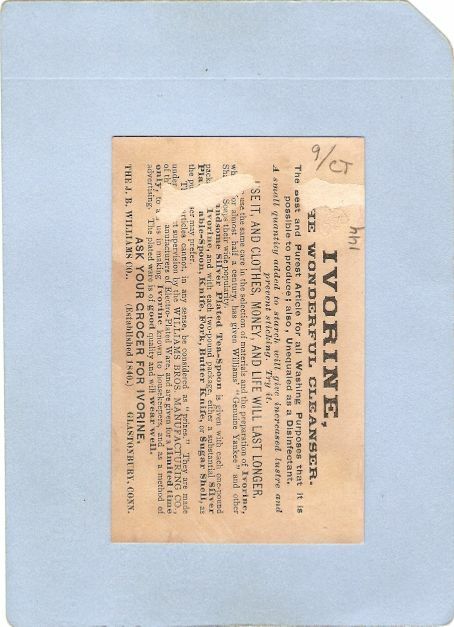 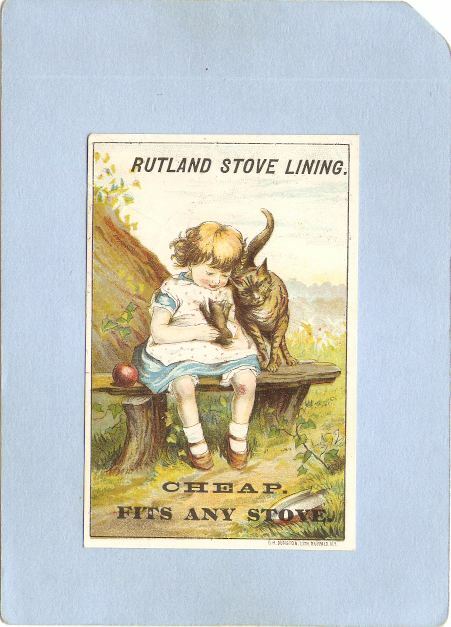 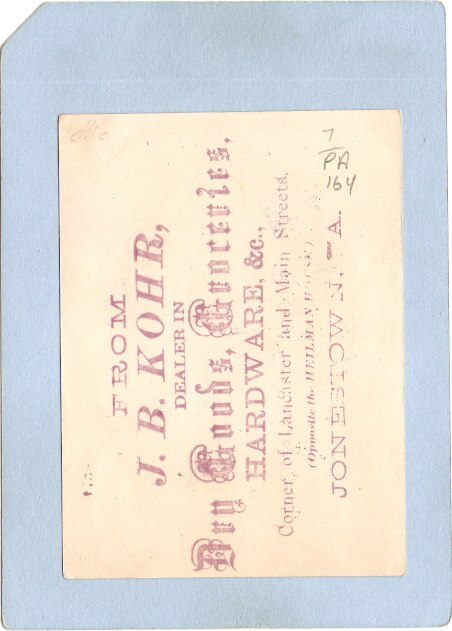 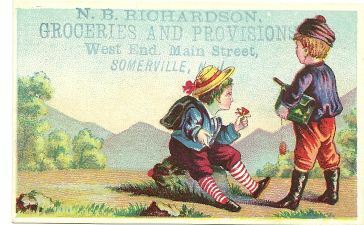 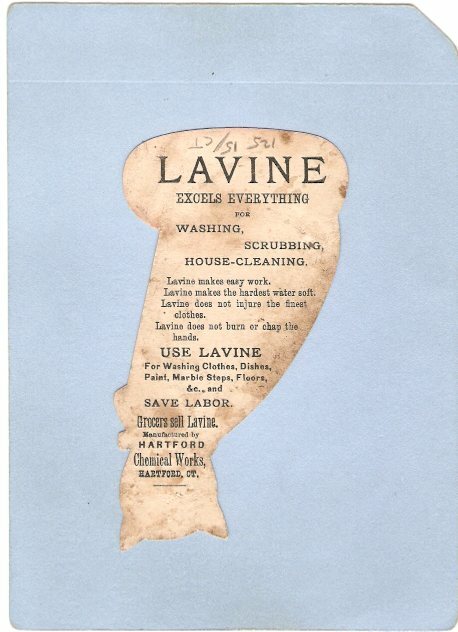 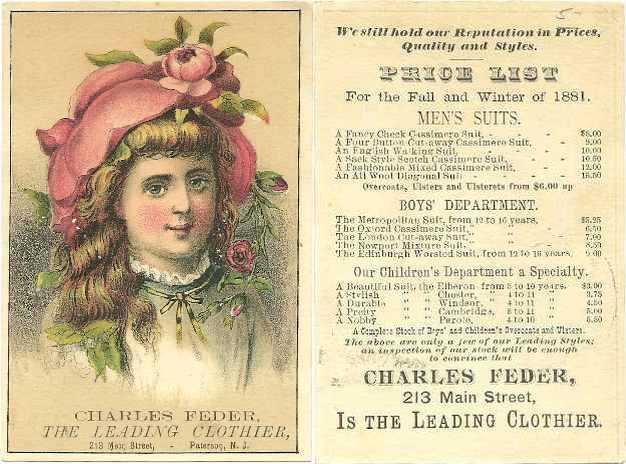 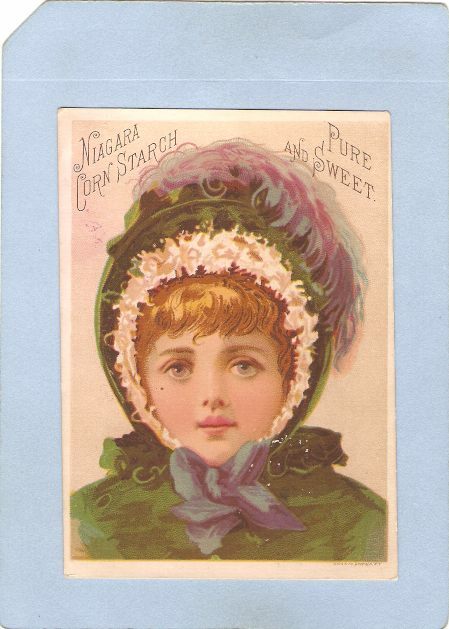 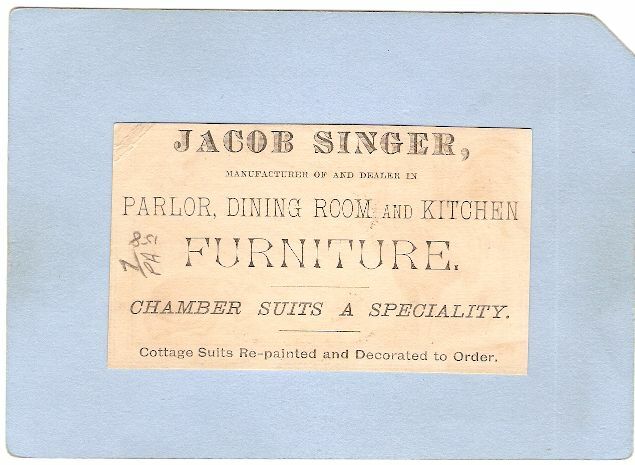 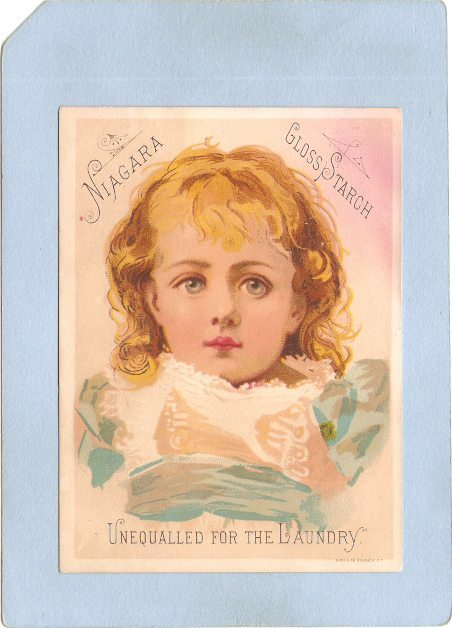 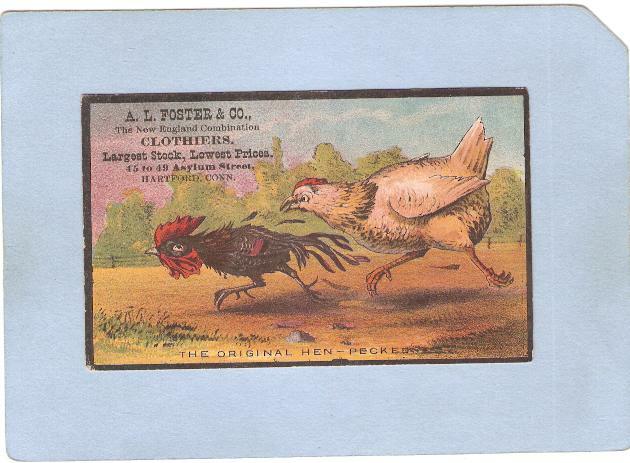 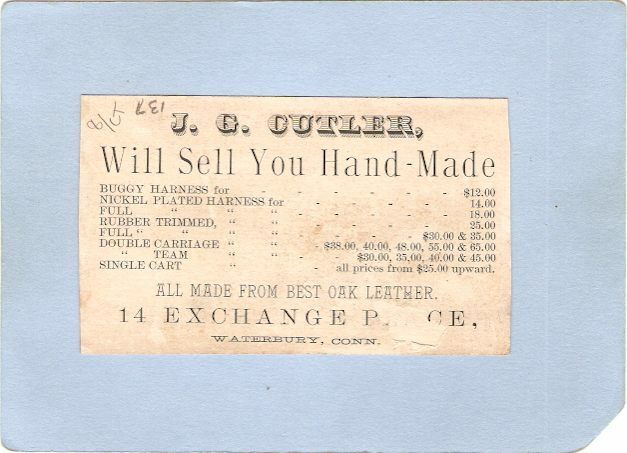 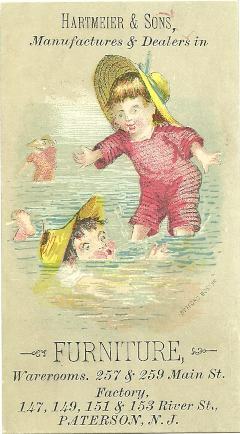 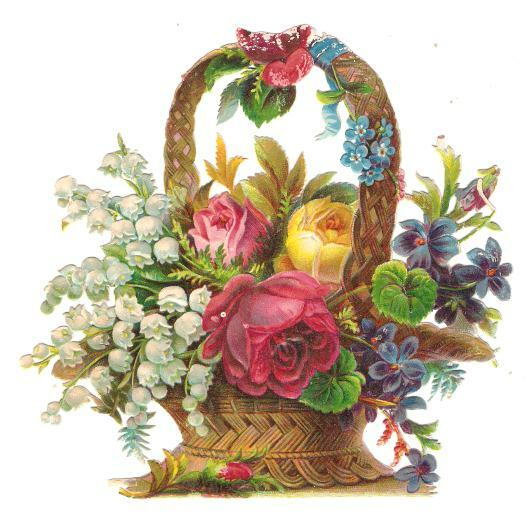 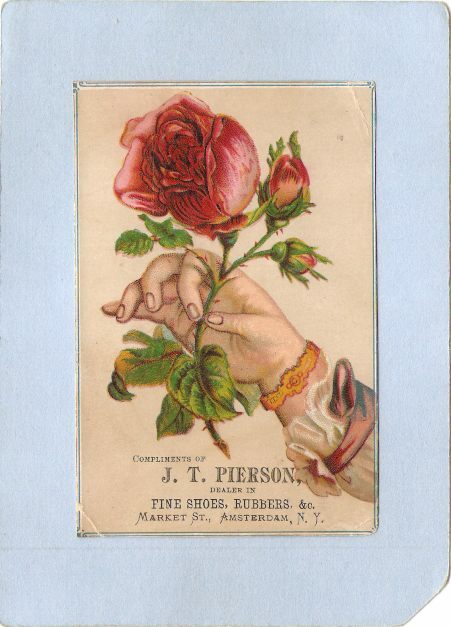 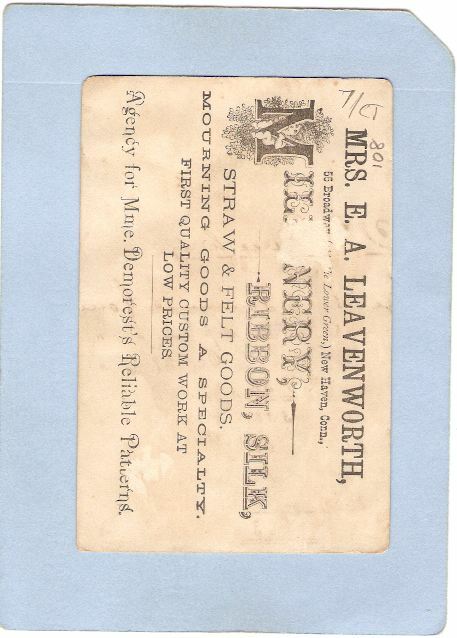 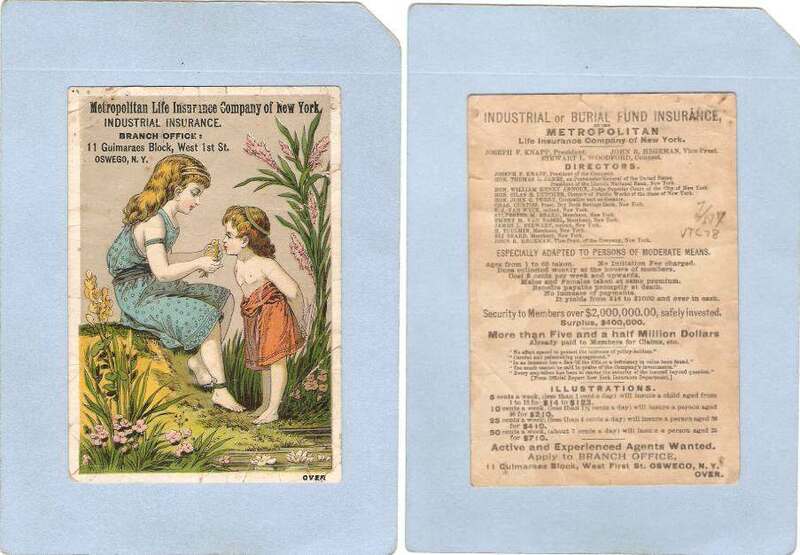 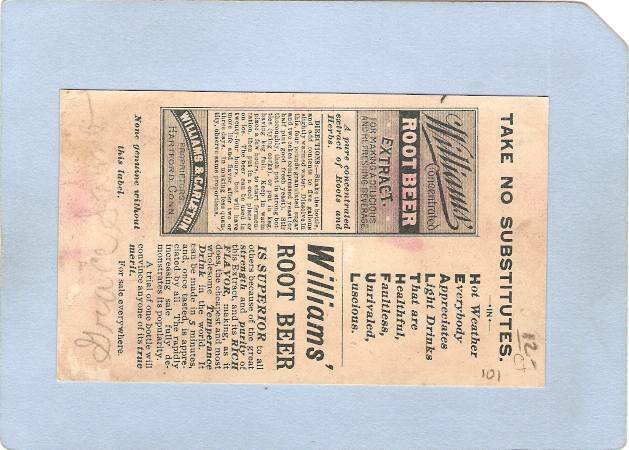 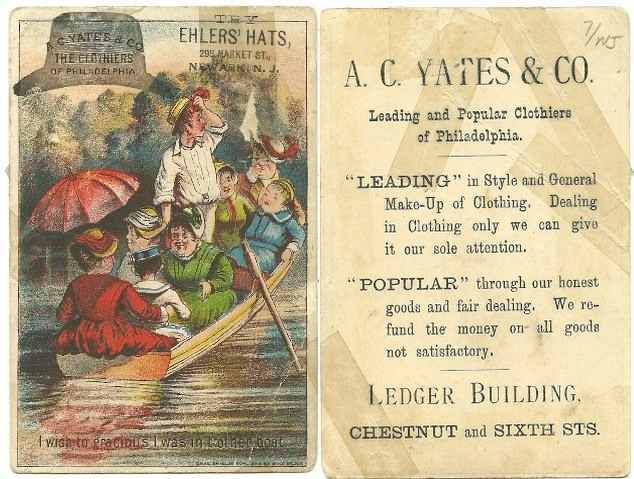 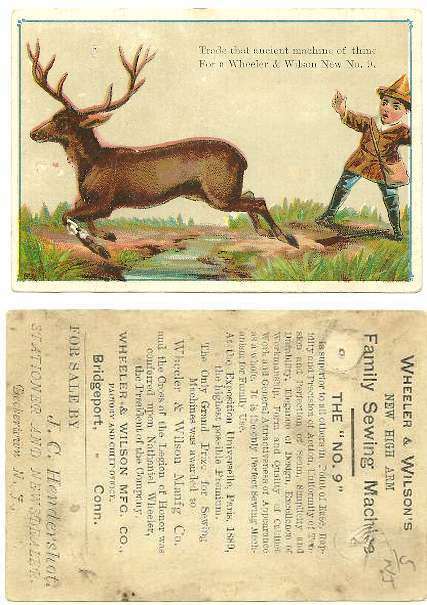 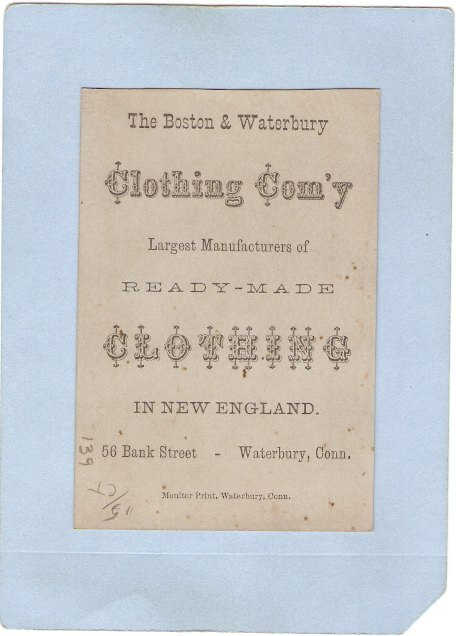 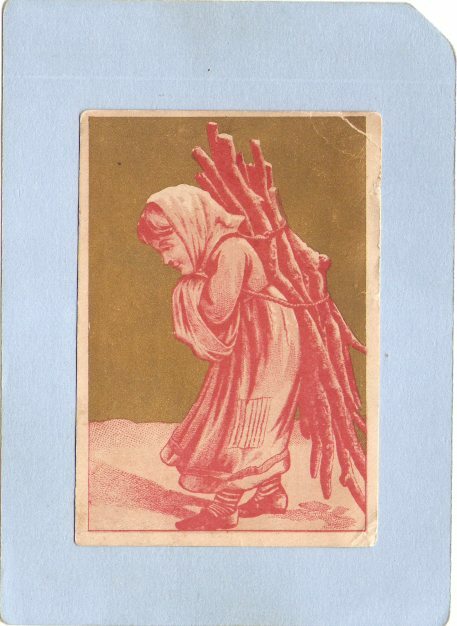 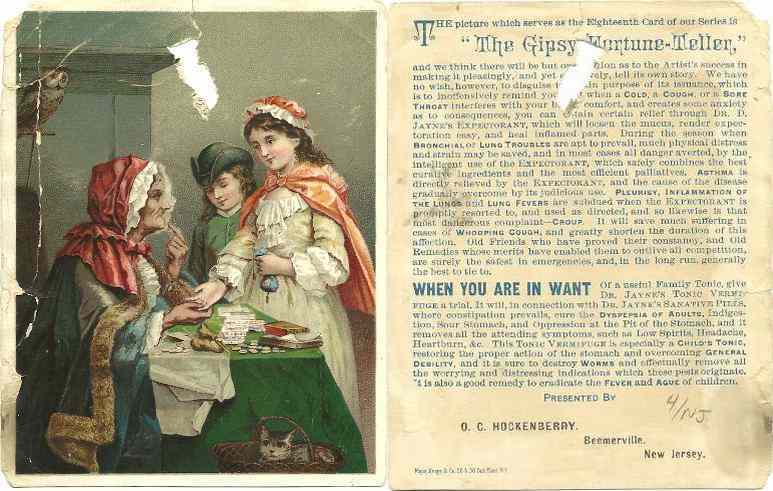 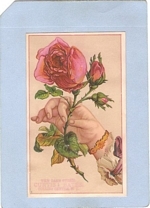 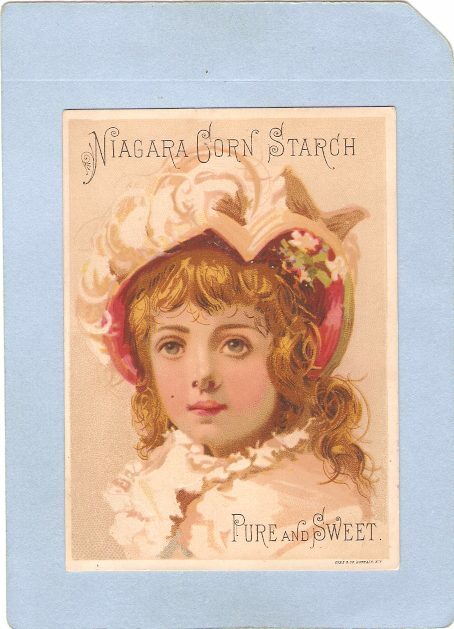 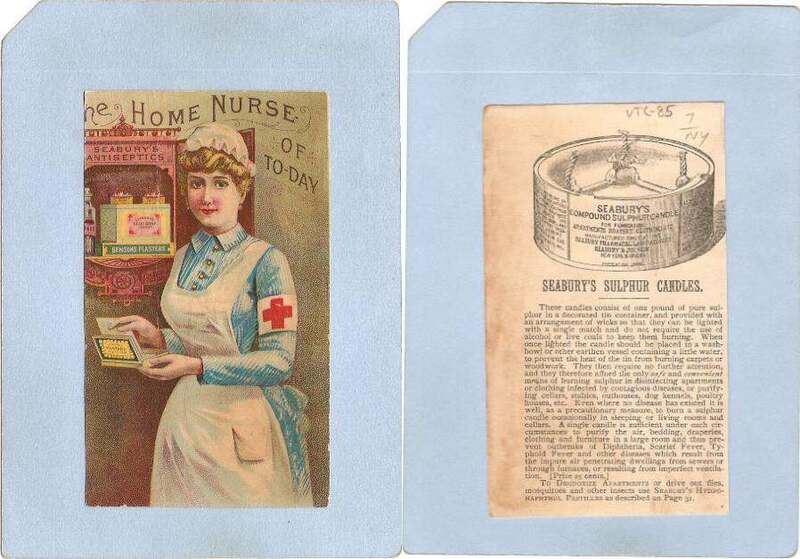 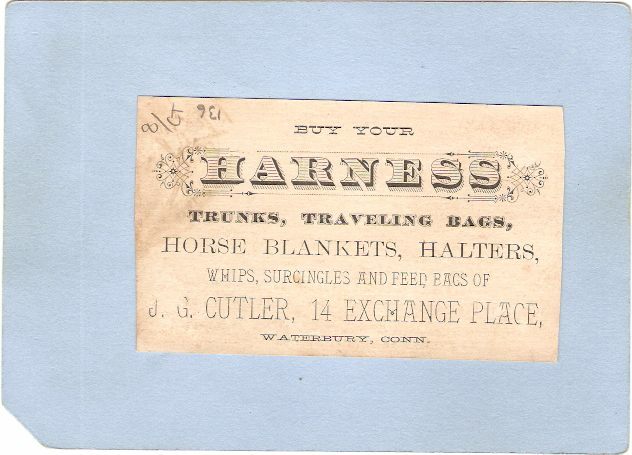 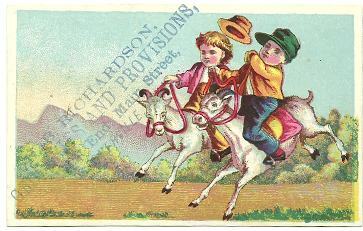 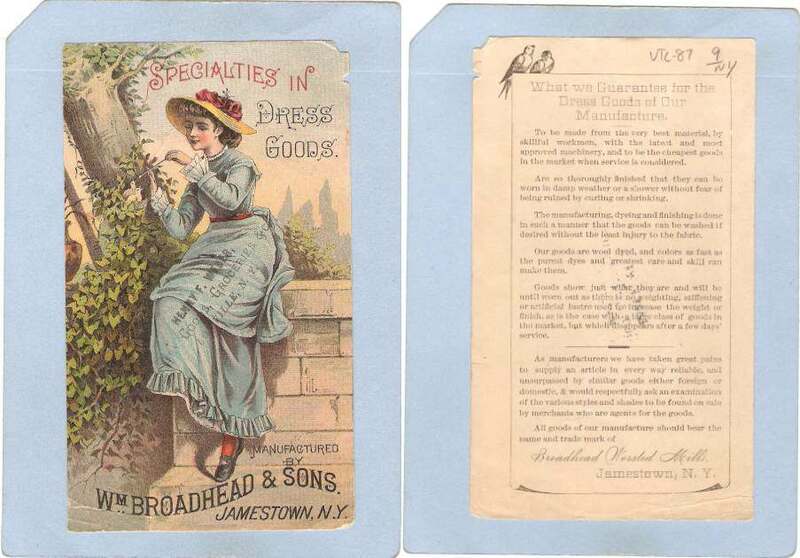 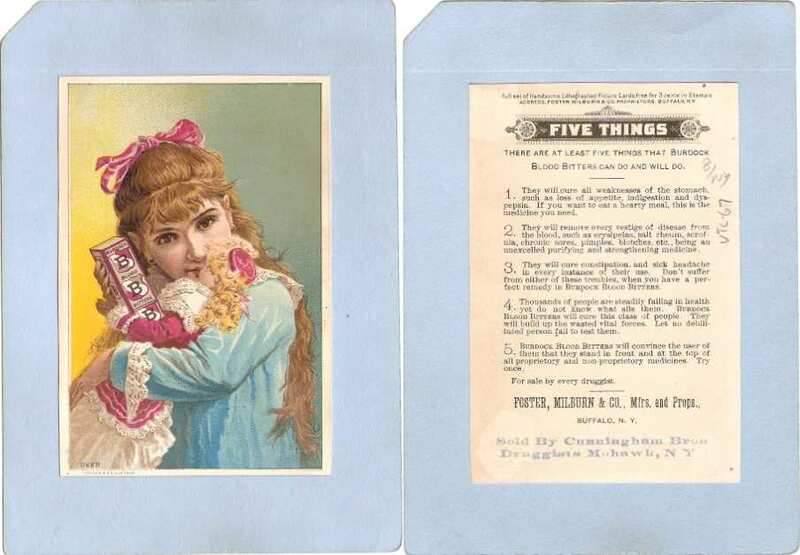 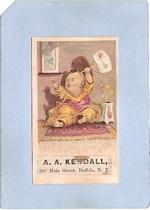 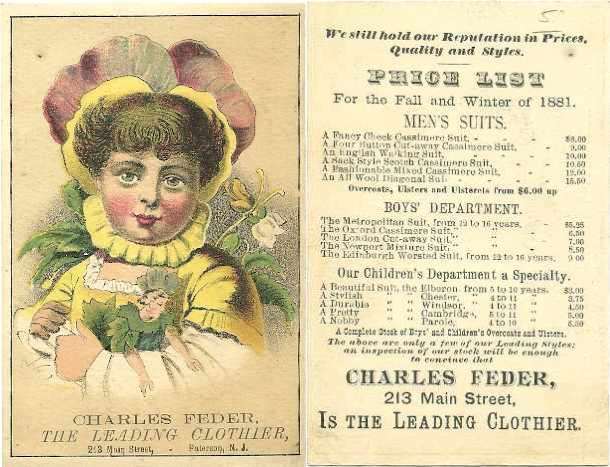 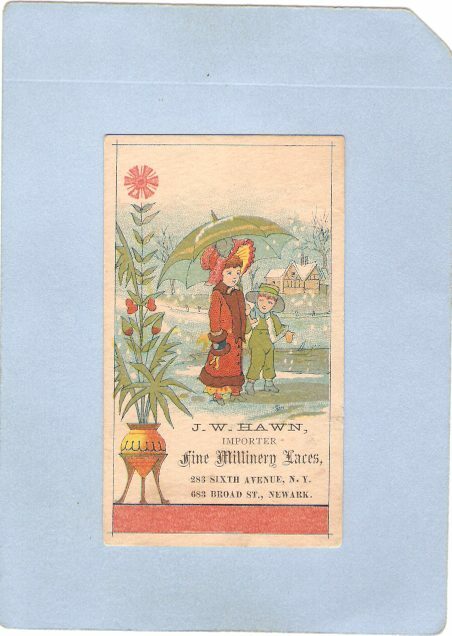 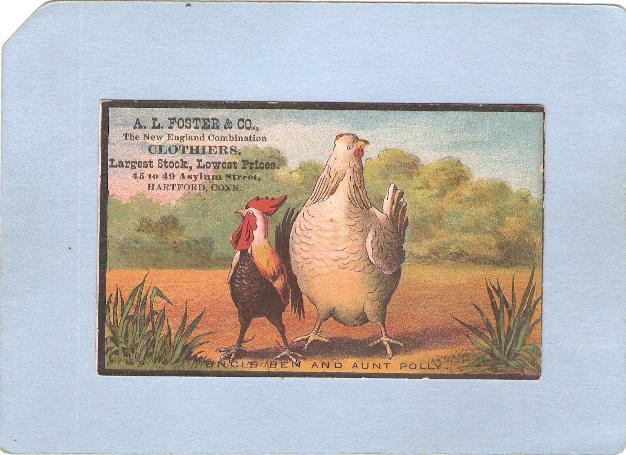 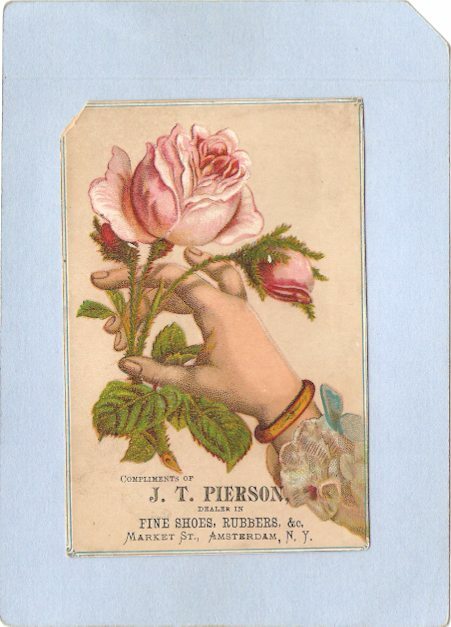 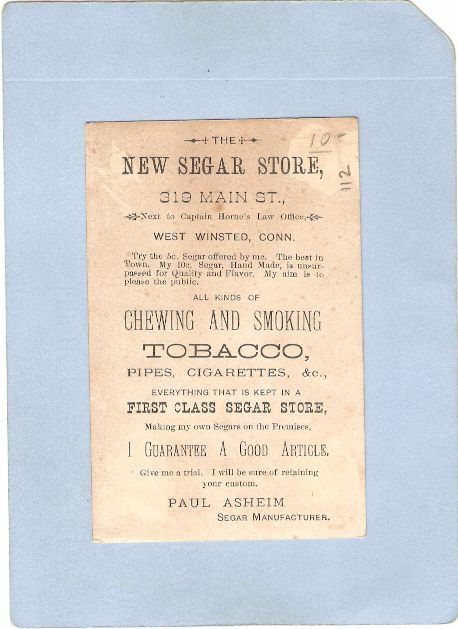 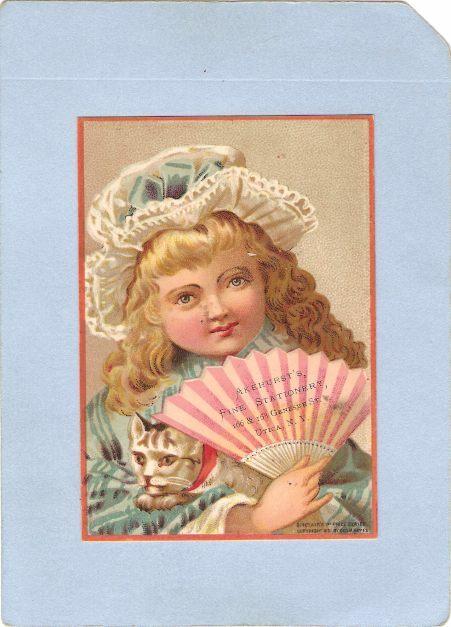 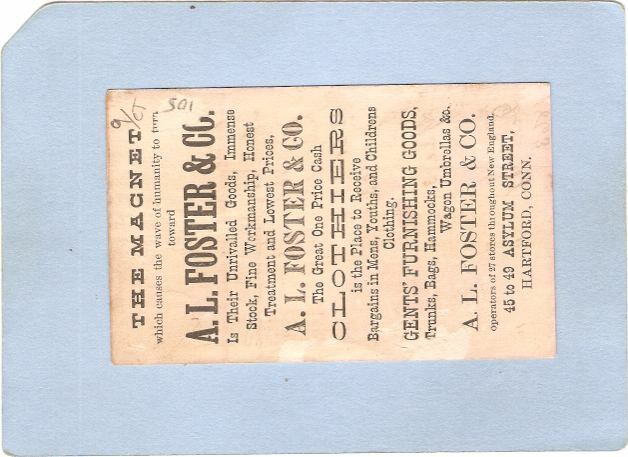 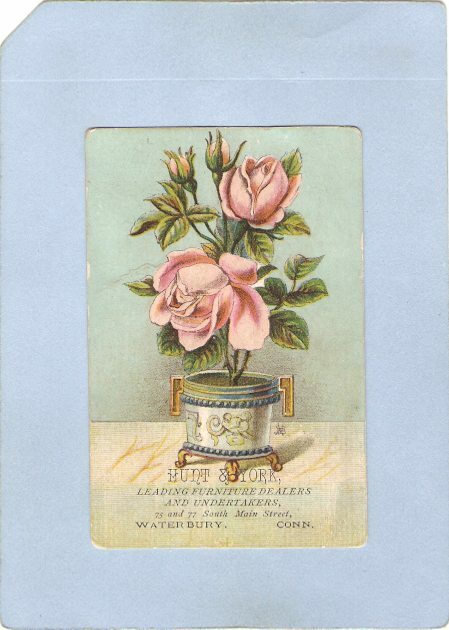 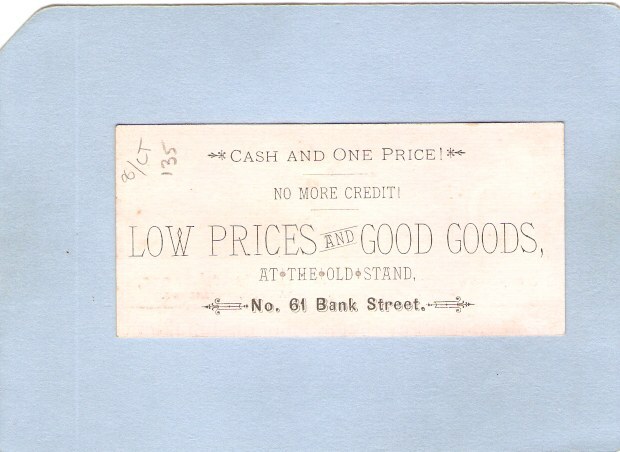 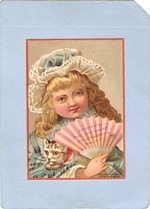 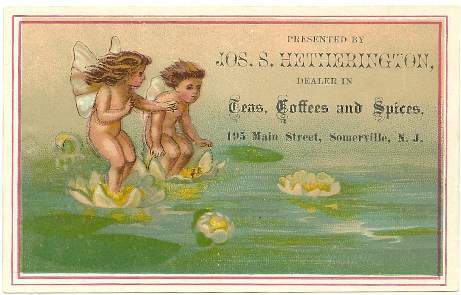 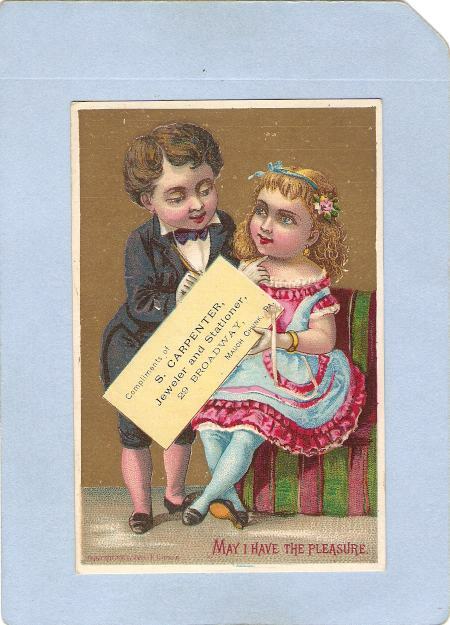 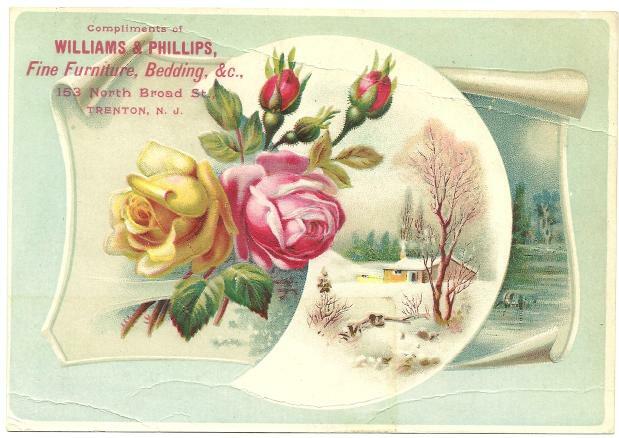 Trade card describes small cards, similar to the visiting cards exchanged in social circles, that businesses would distribute to clients and potential customers. 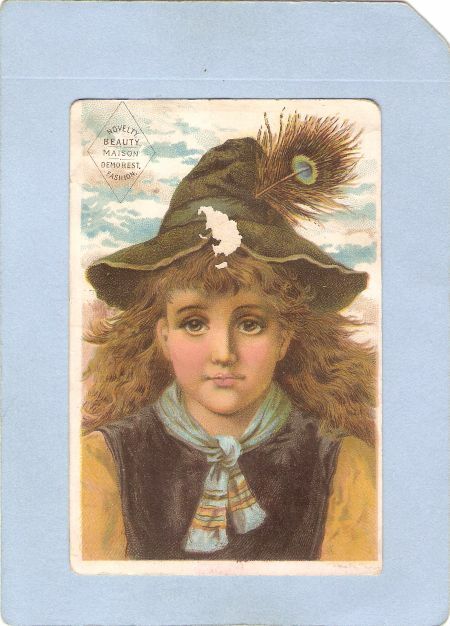 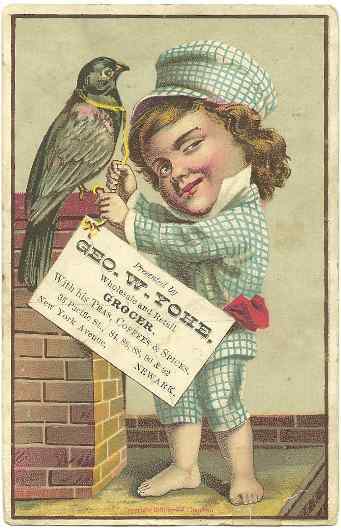 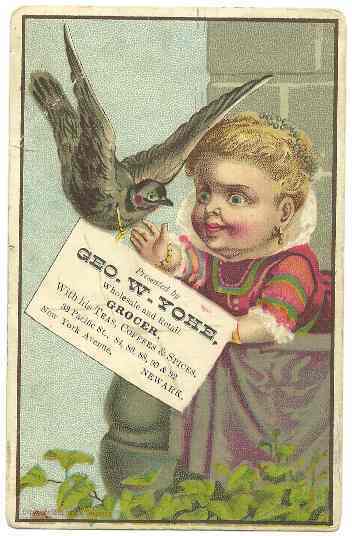 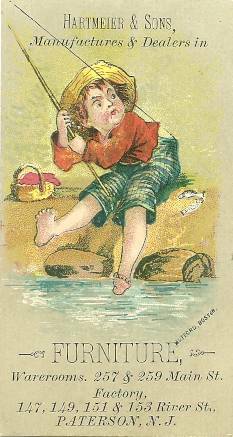 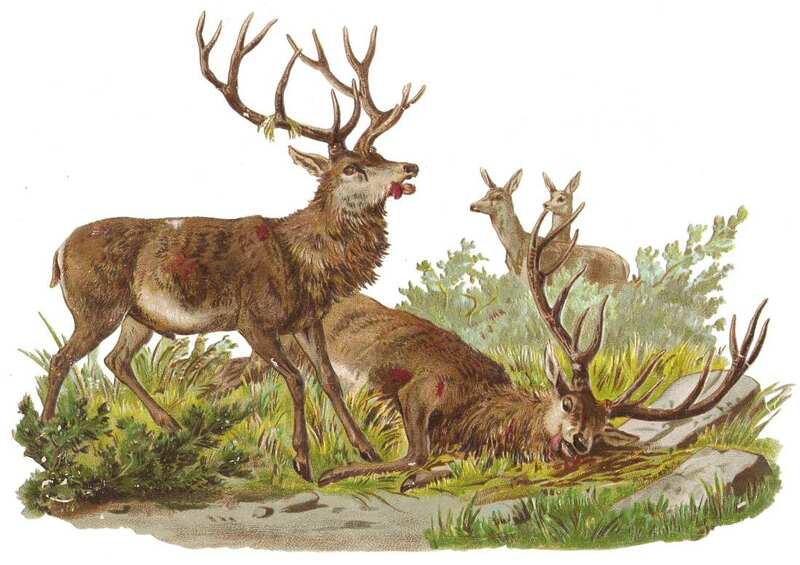 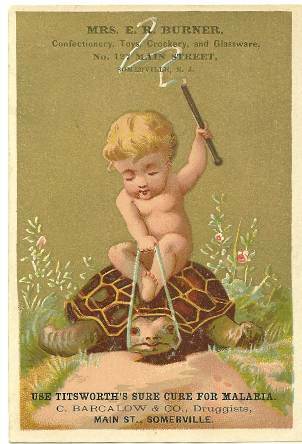 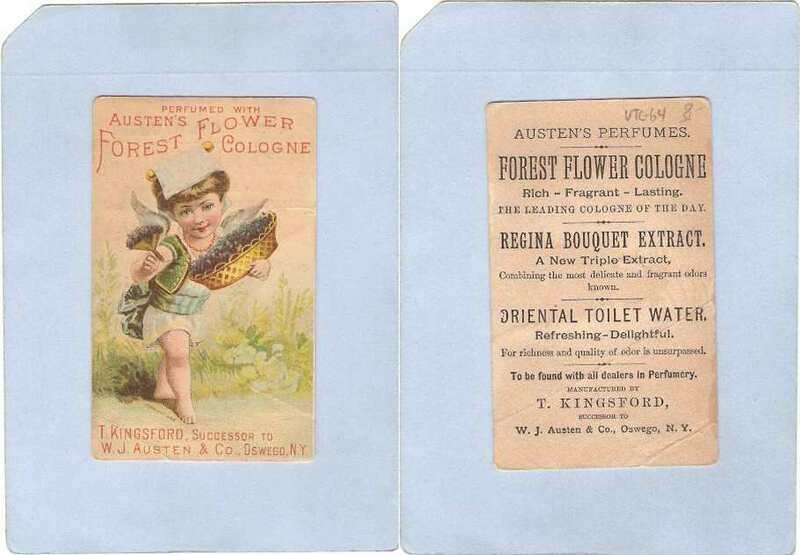 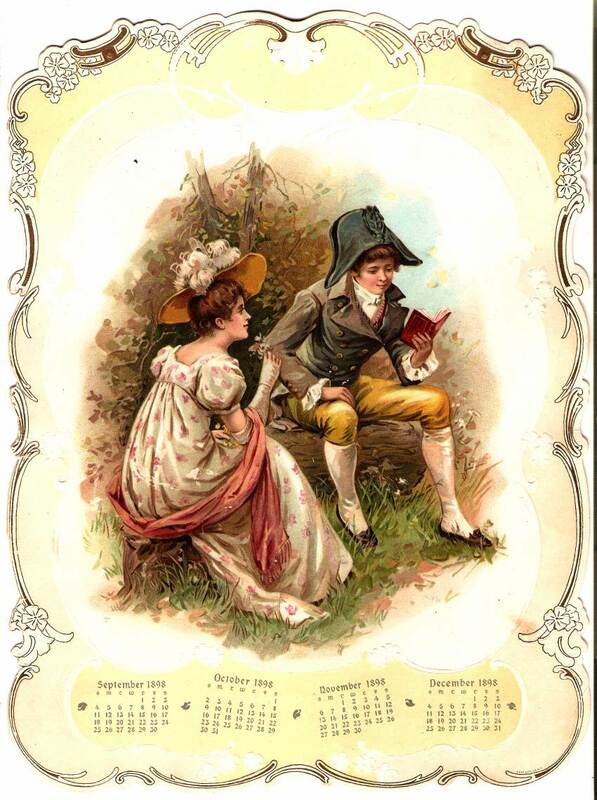 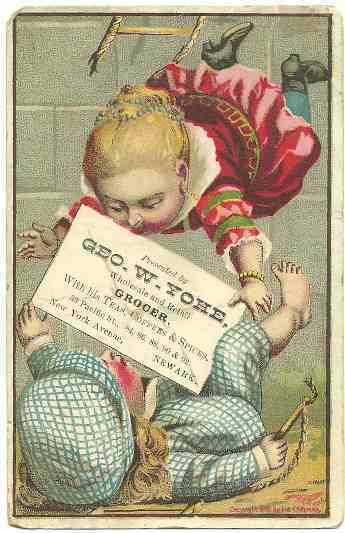 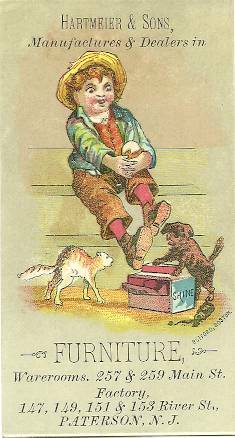 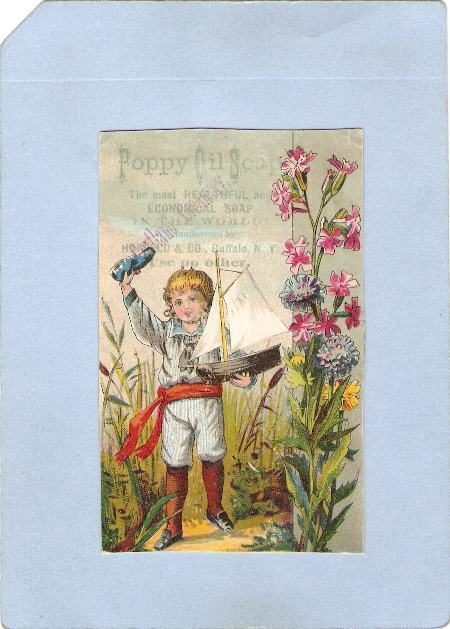 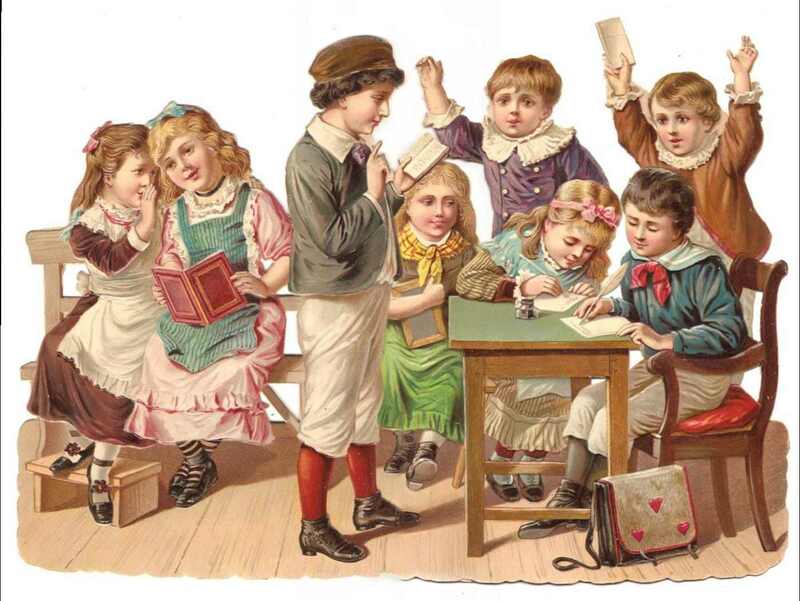 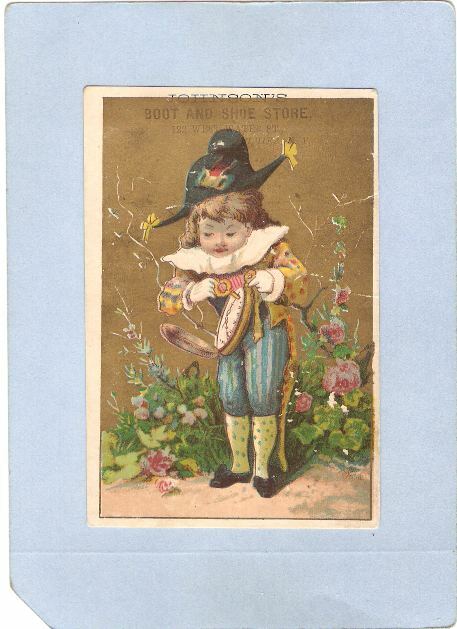 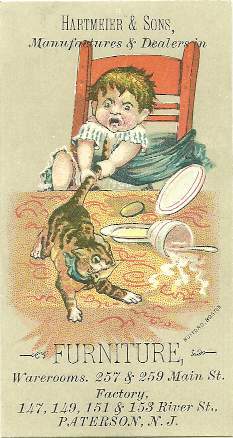 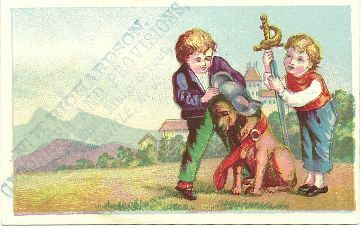 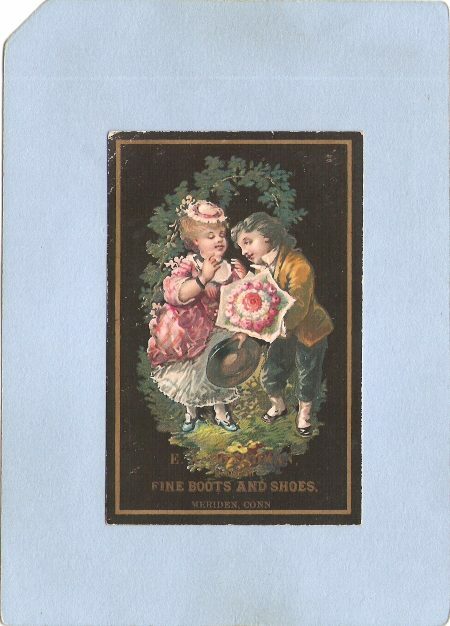 Trade cards first became popular at the beginning of the 17th century in London. 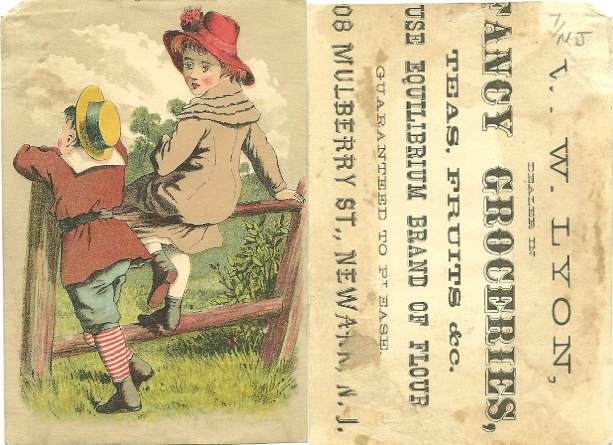 These functioned as advertising and also as maps, directing the public to merchants' stores, as no formal street address numbering system existed at the time. 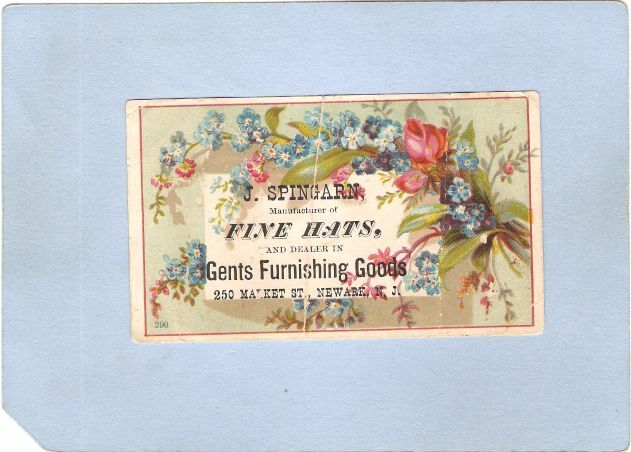 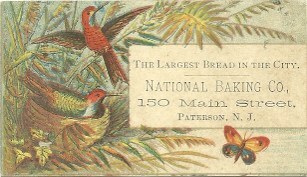 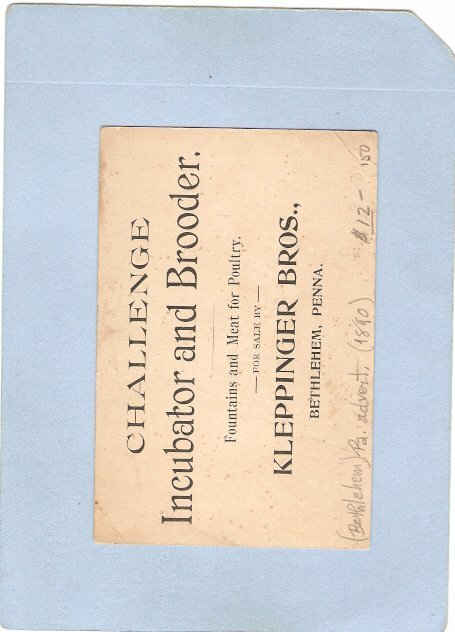 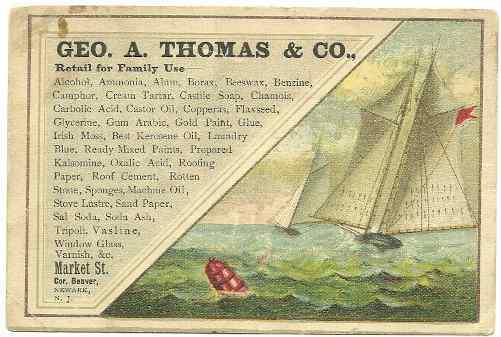 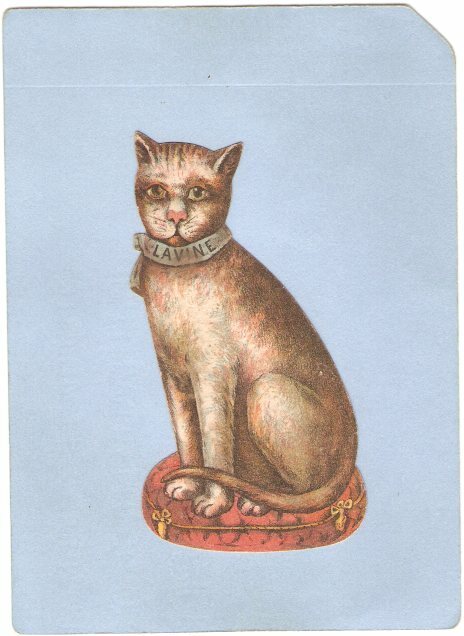 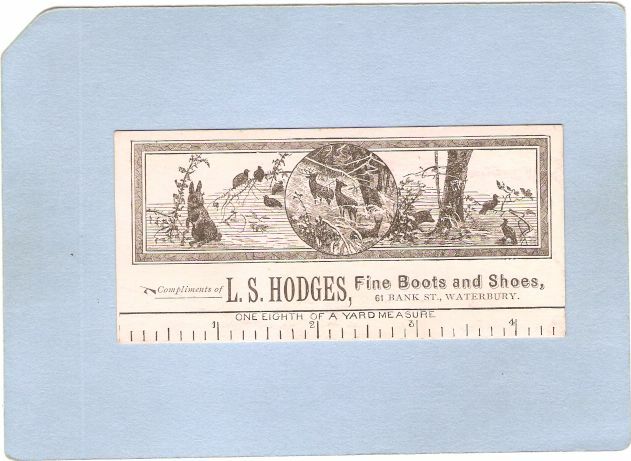 The trade card is an early example of the modern business card. 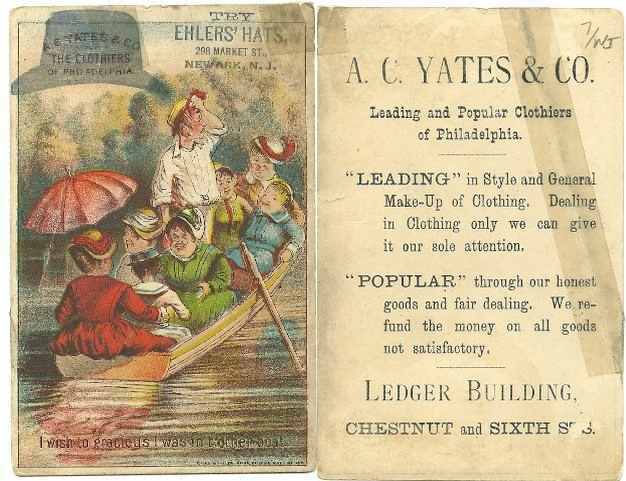 Some businesses began to create increasingly sophisticated designs, especially with the development of color printing. 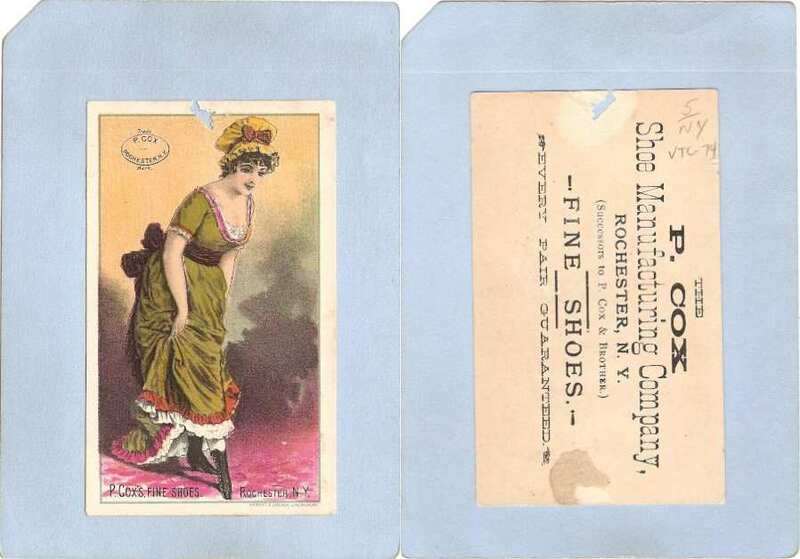 A few companies specialized in producing stock cards, usually with an image on one side and space on the other side for the business to add its own information. 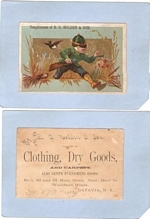 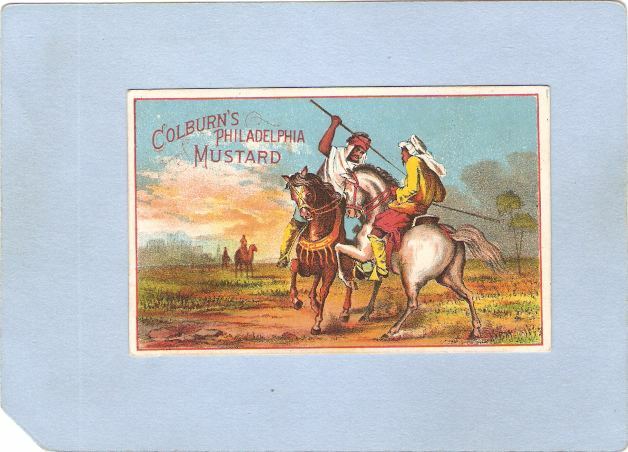 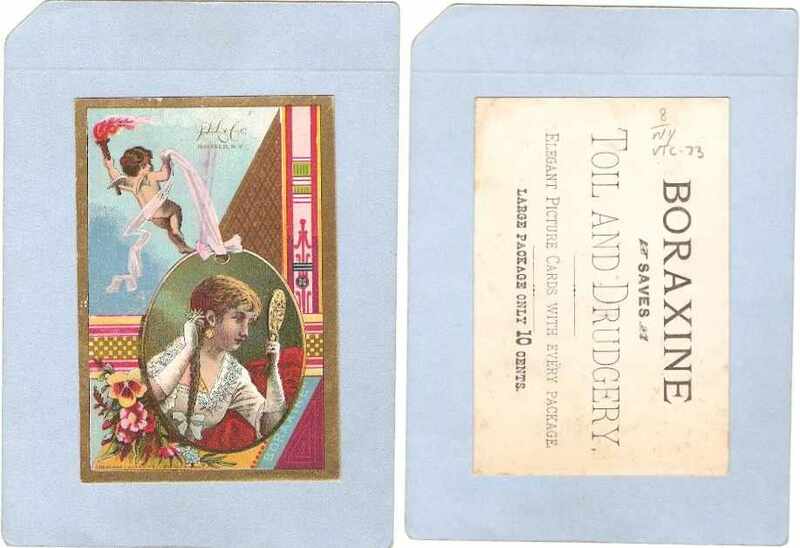 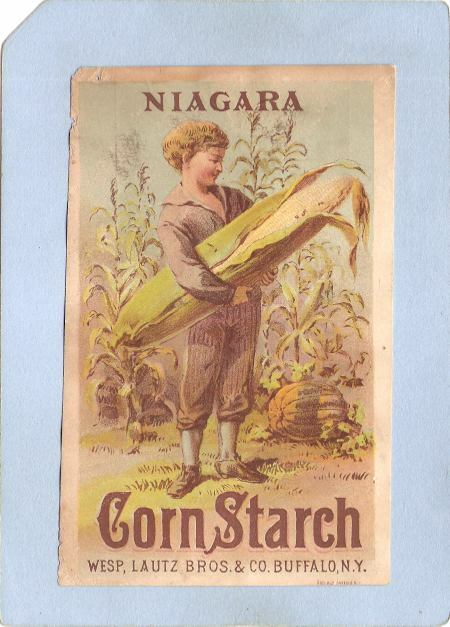 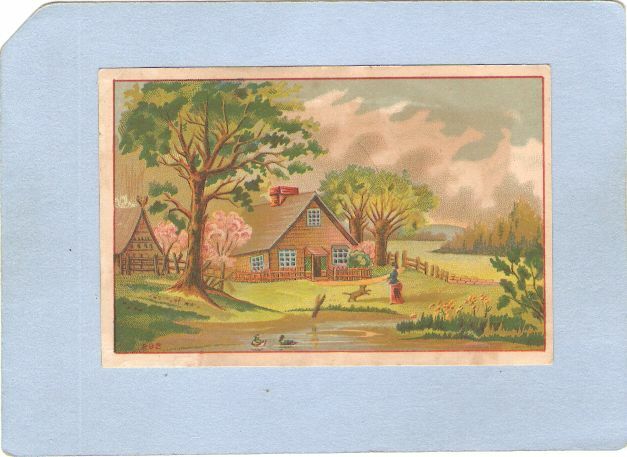 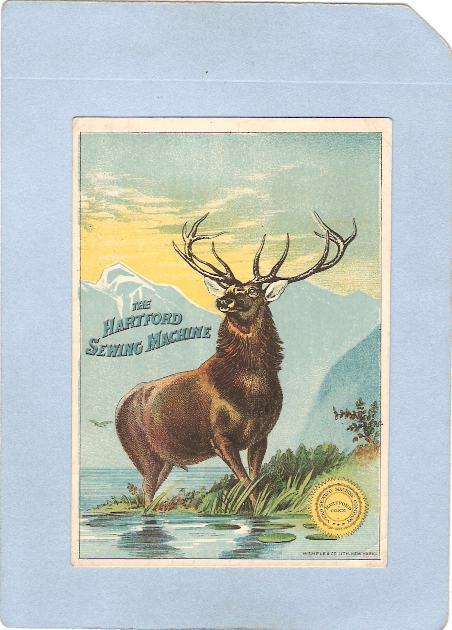 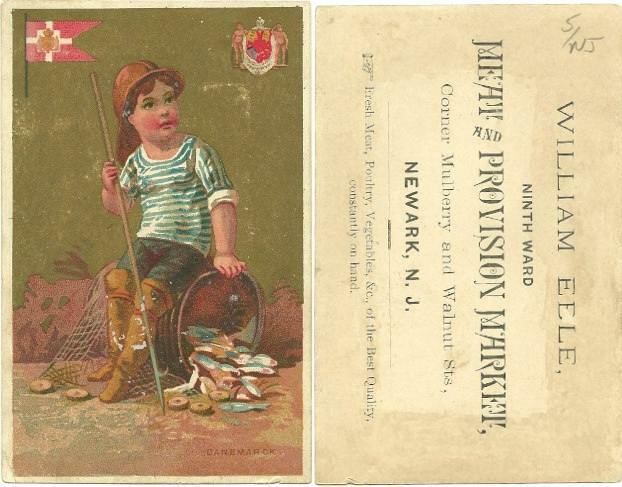 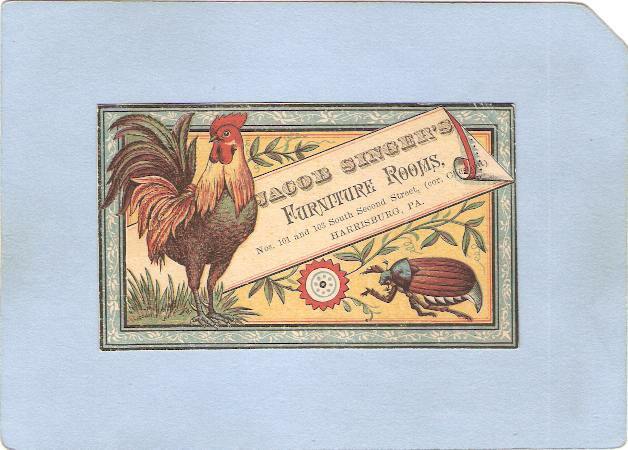 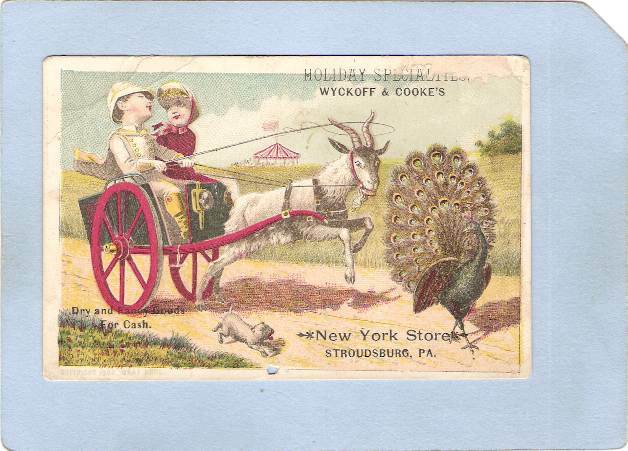 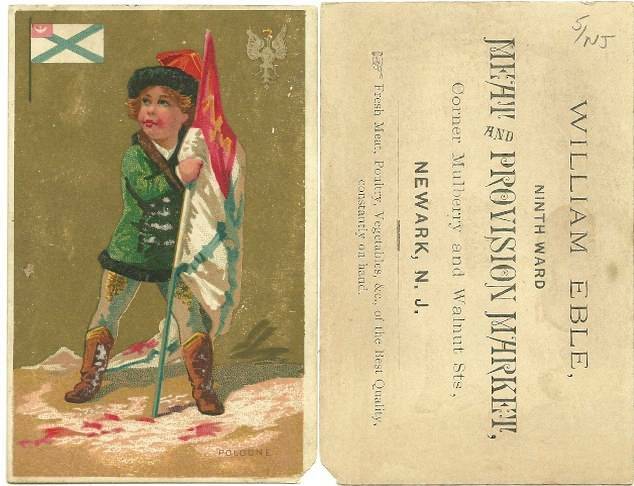 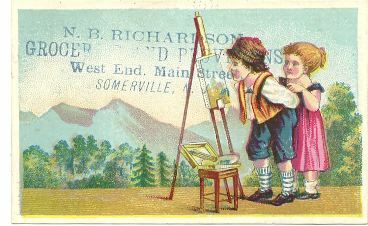 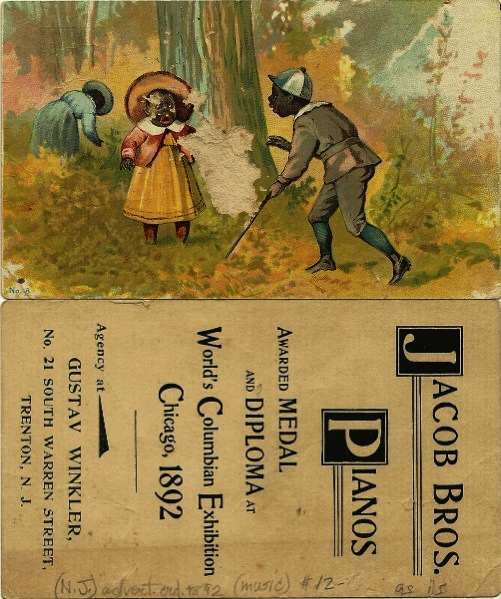 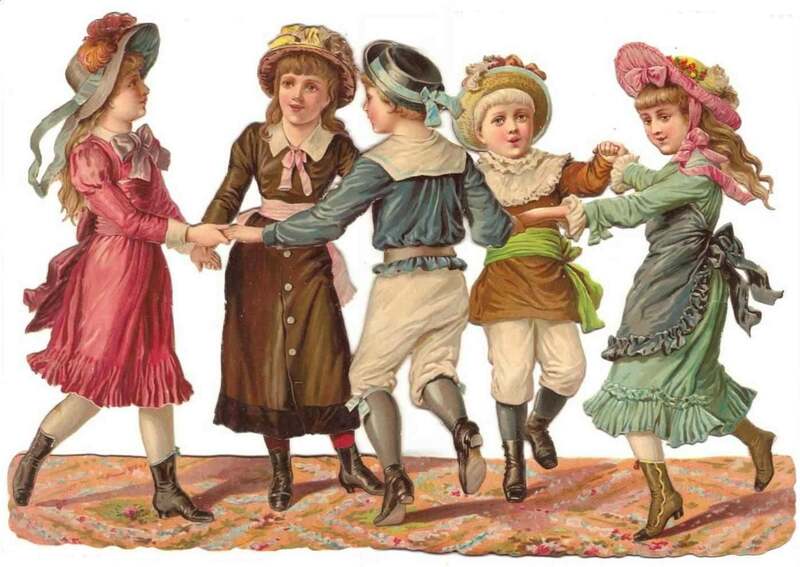 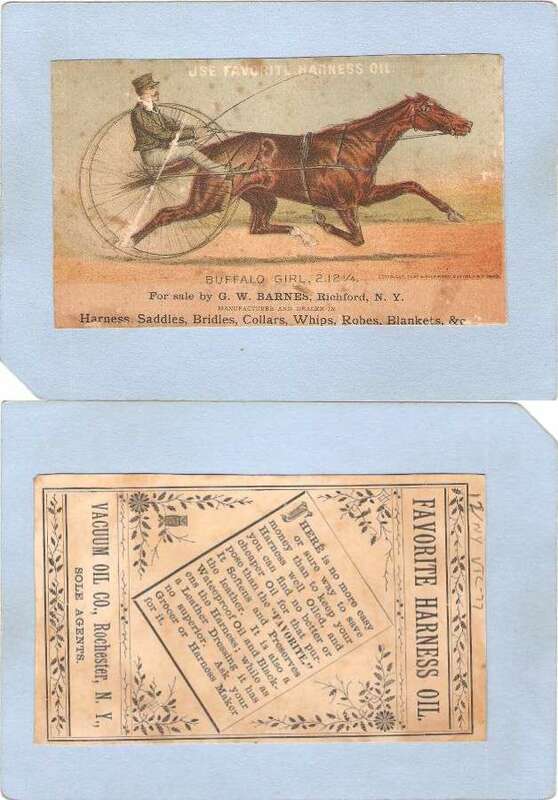 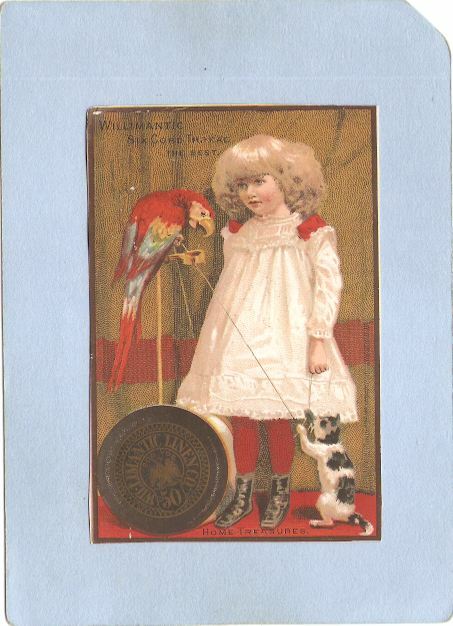 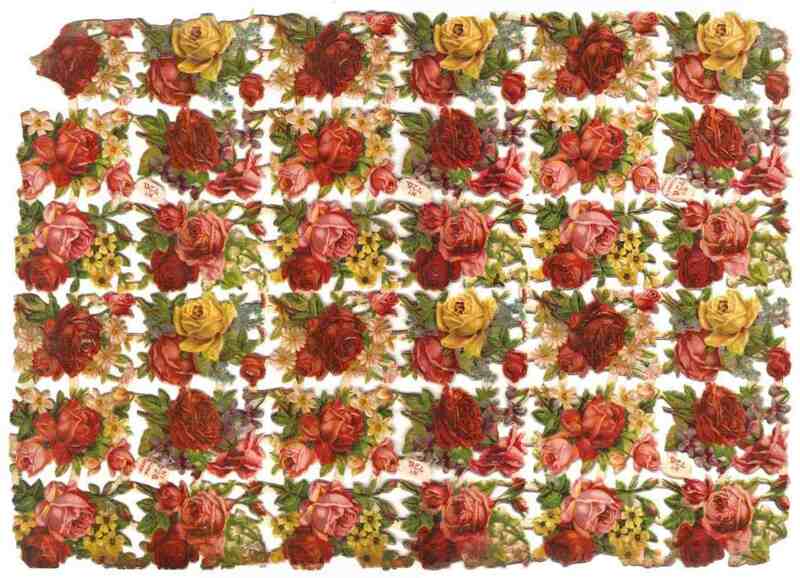 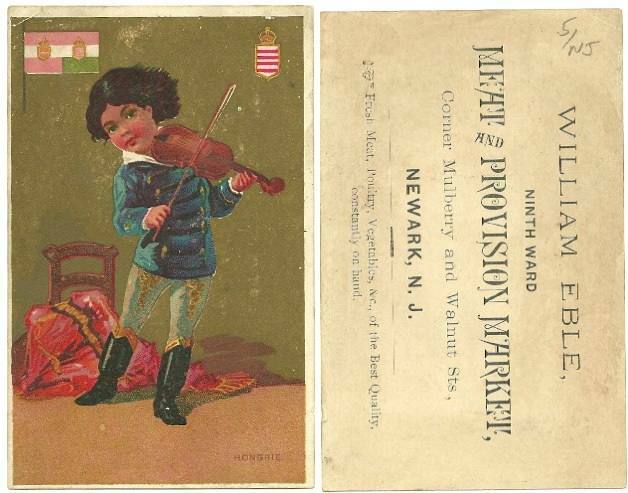 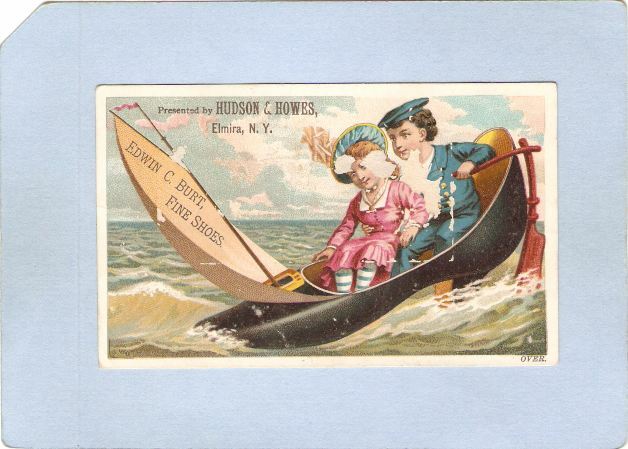 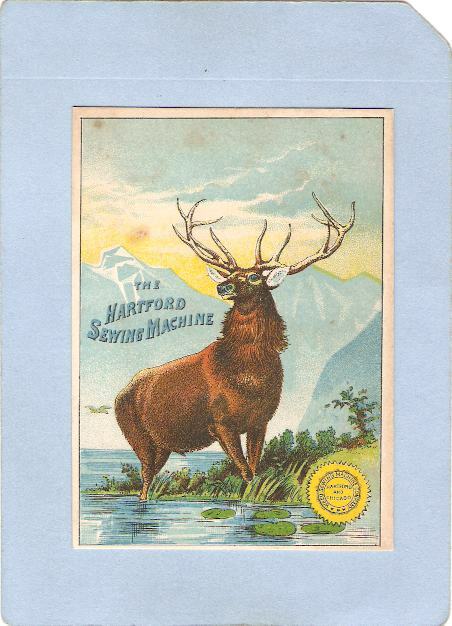 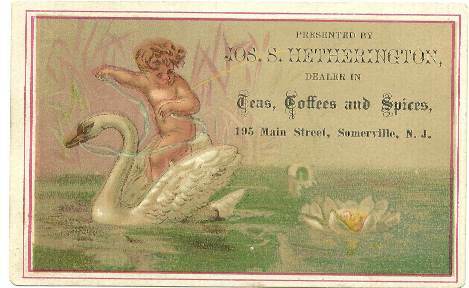 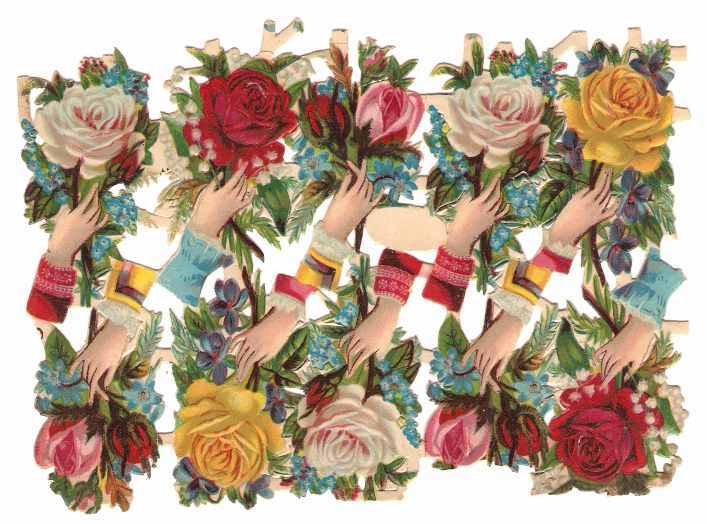 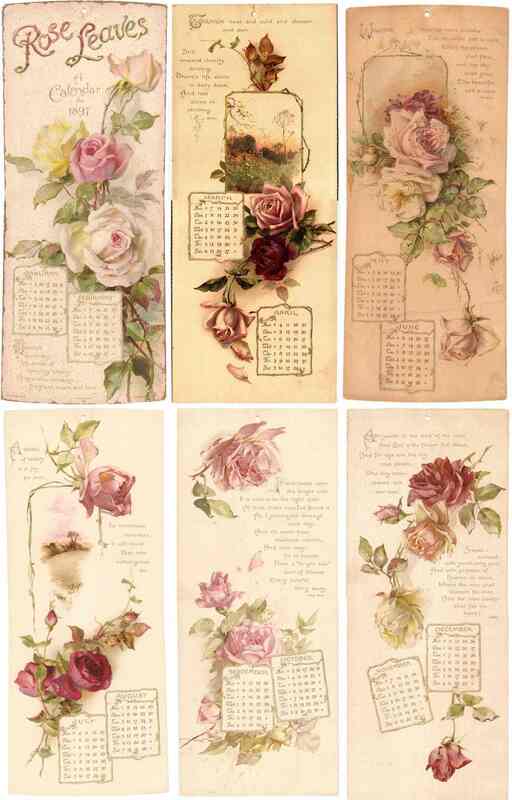 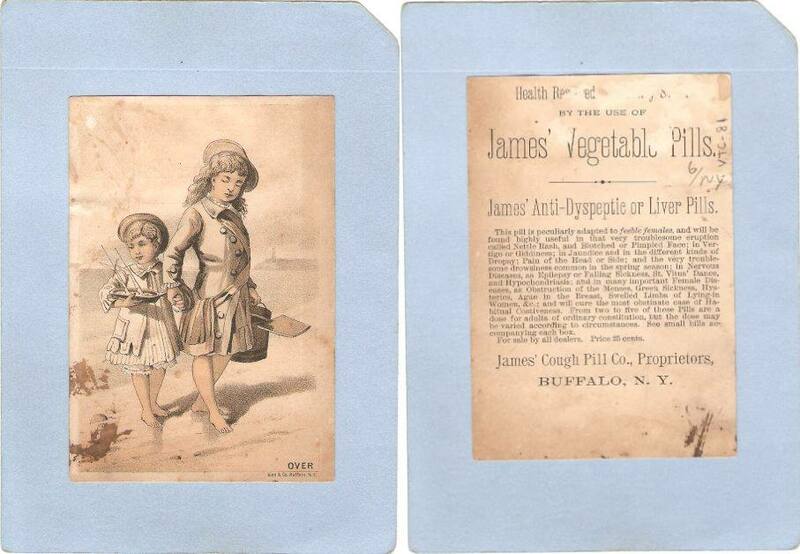 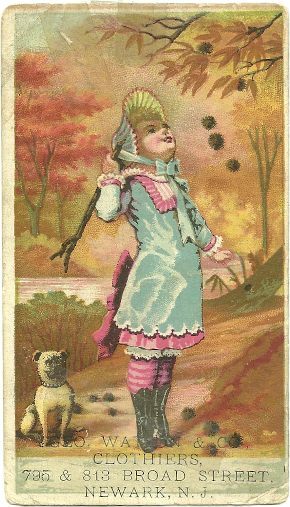 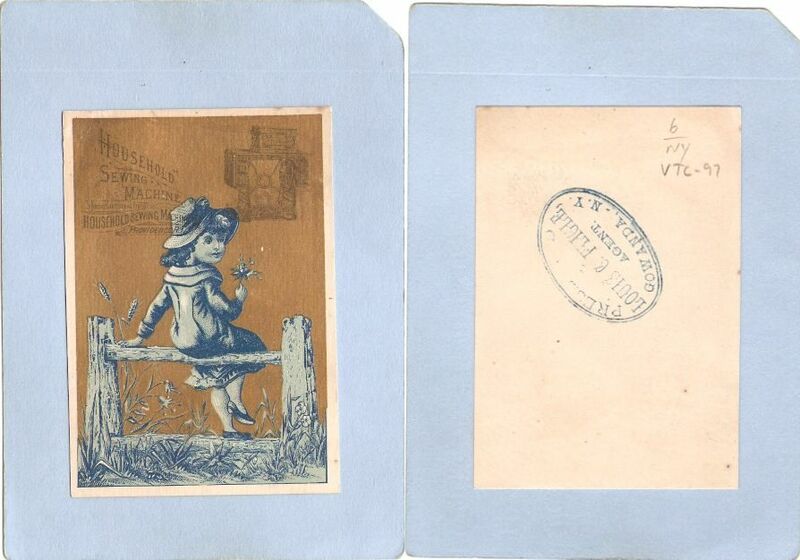 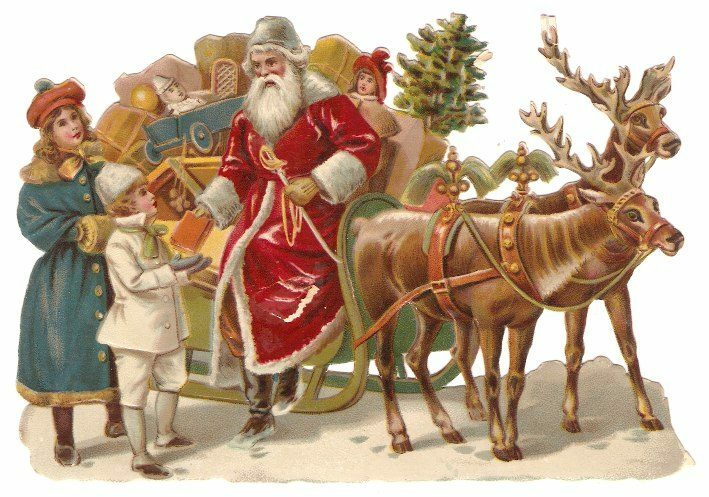 As the designs became more attractive and colorful, collecting trade cards became a popular hobby in the late 19th century, since color images were not yet widely available. 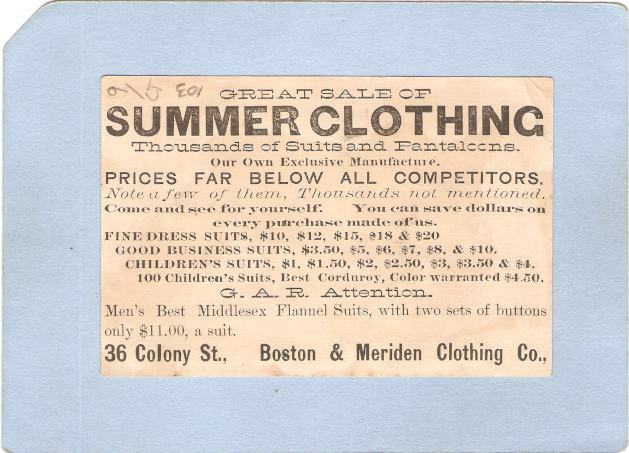 In its original sense, the "trade" in trade card refers to its use by the proprietor of a business to announce his trade, or line of business. 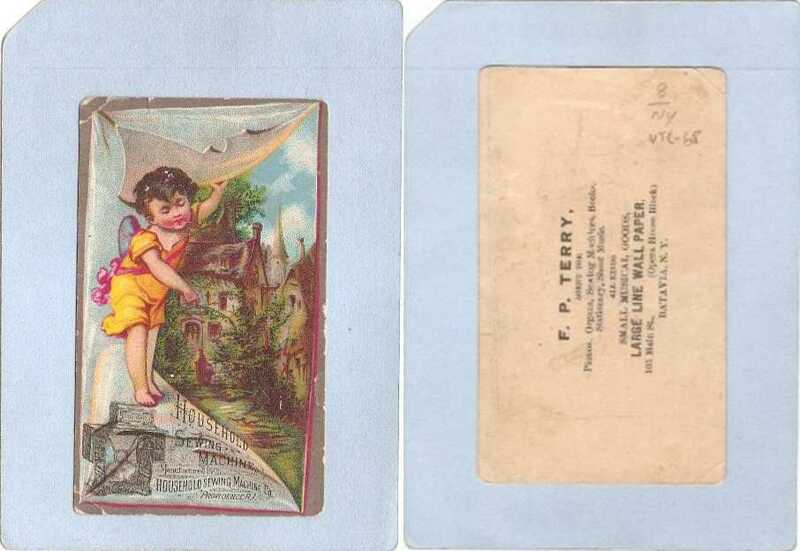 By moving into the realm of collecting, trade cards gave rise to the trading card, the meaning now shifting to the exchange or trade of cards by enthusiasts. 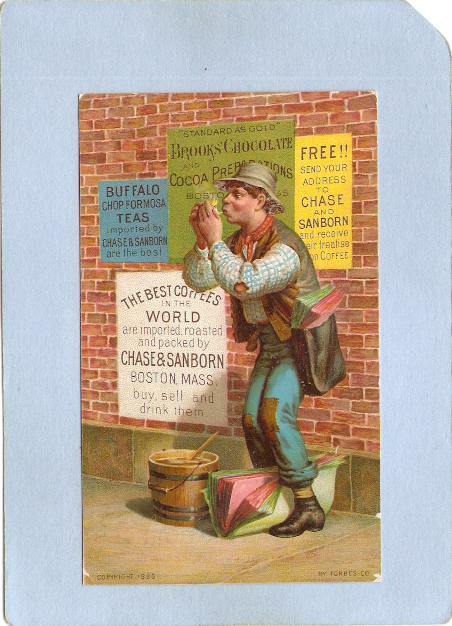 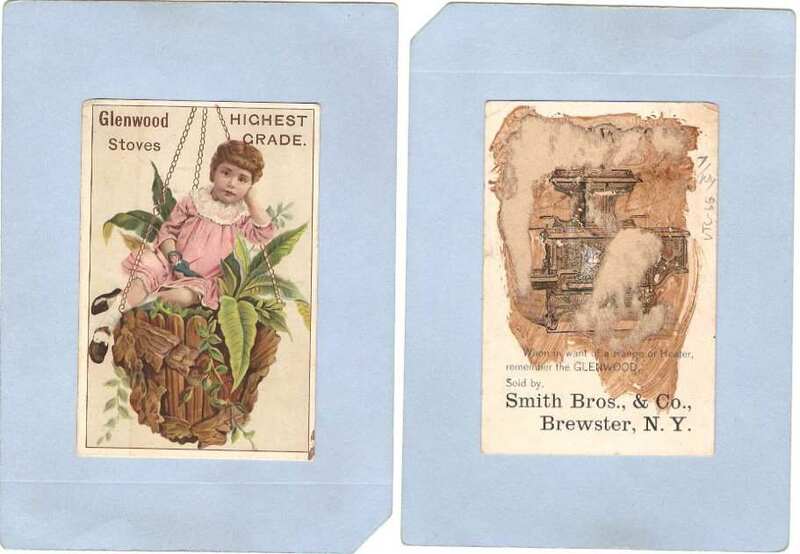 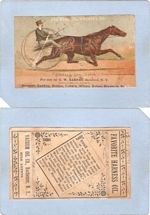 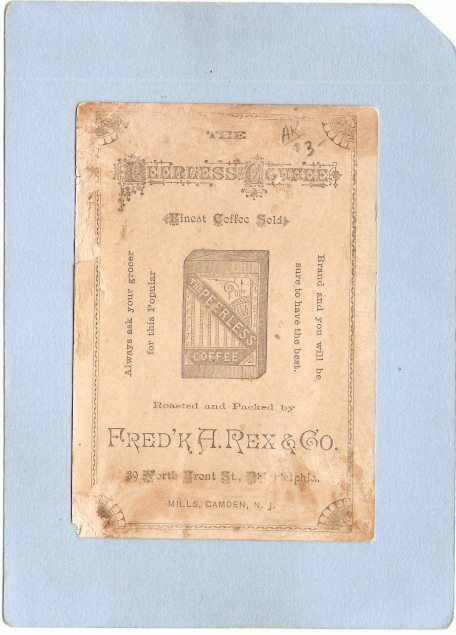 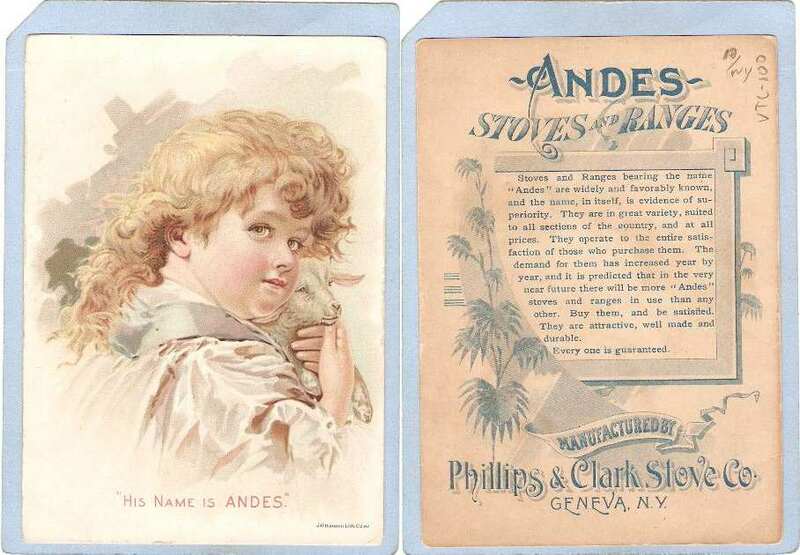 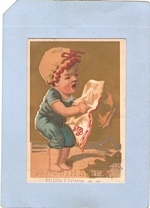 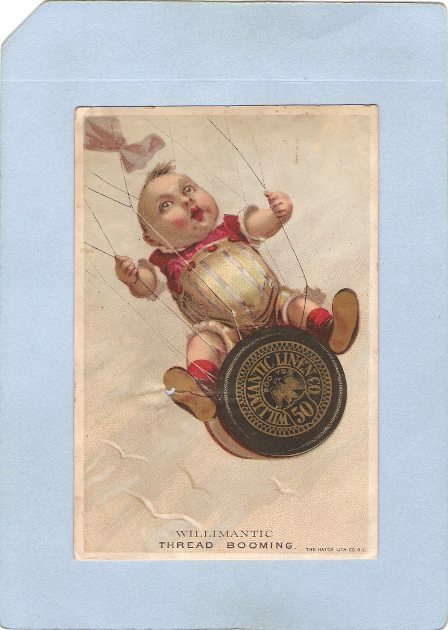 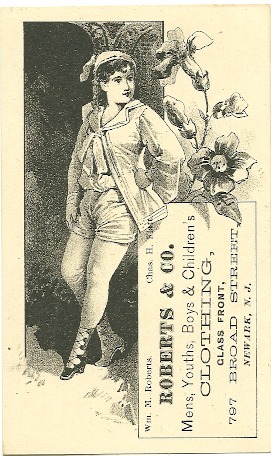 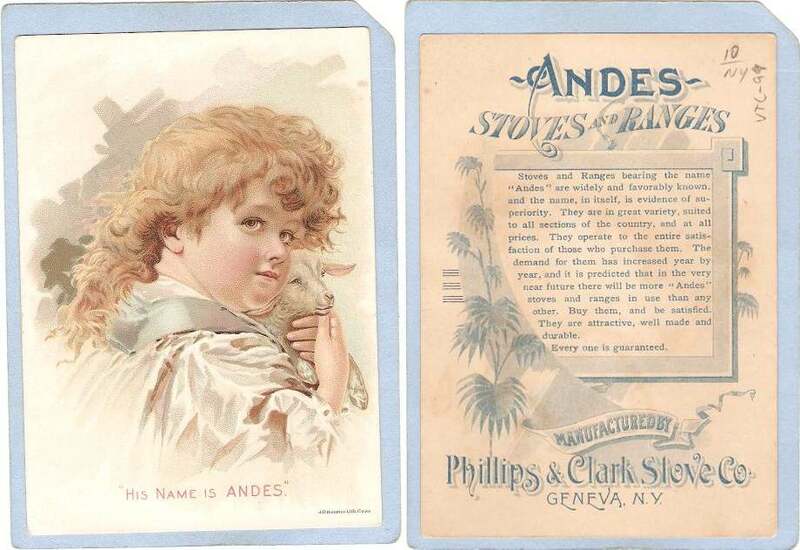 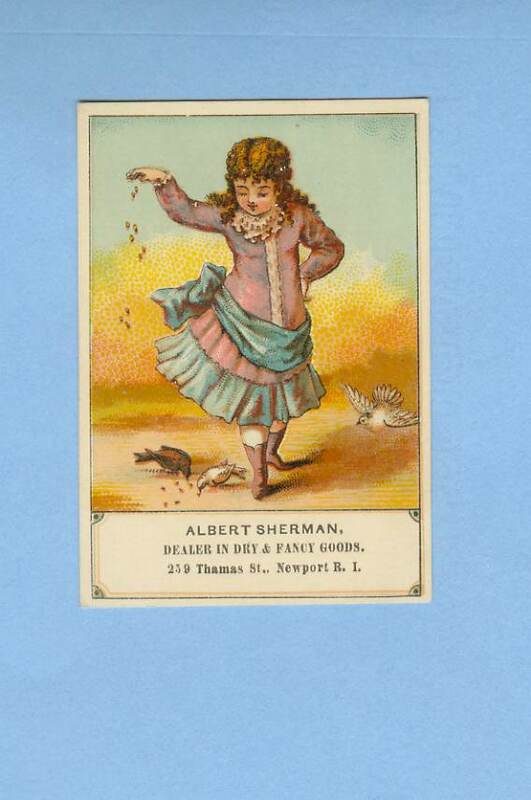 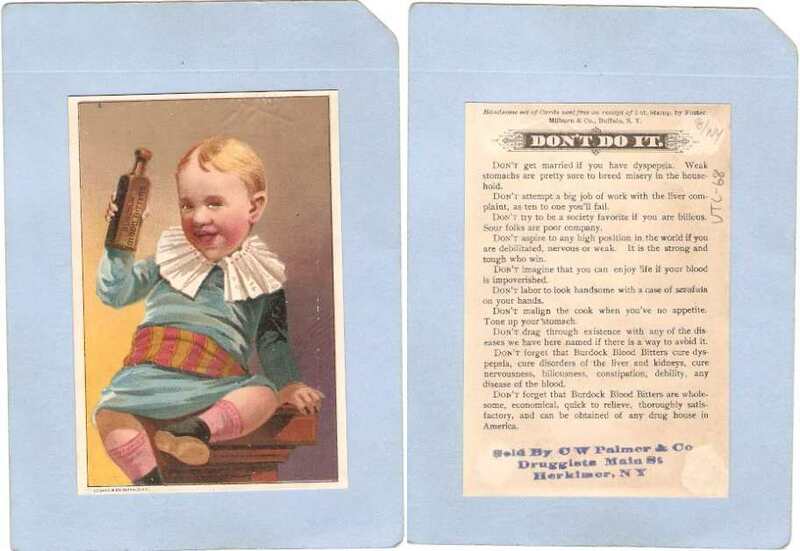 Some cards, particularly those produced by tobacco companies featuring baseball players, later developed into collectibles and lost their function as a business advertisement. 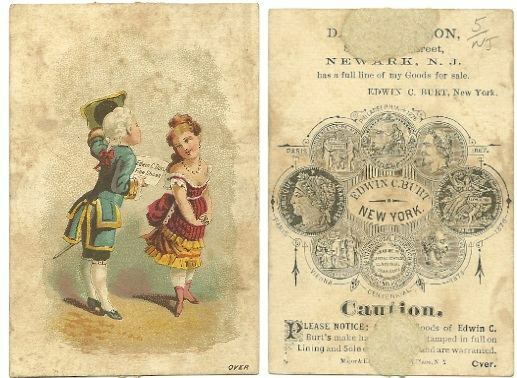 VTC-58 (IL) - Chicago - Die Cut/Victorian Trade Card - Huge die cut for Andrew's Pearl Baking Powder in shape of a bell Overall fine condition Huge die cut for Andrew's Pearl Baking Powder in shape of a bell. 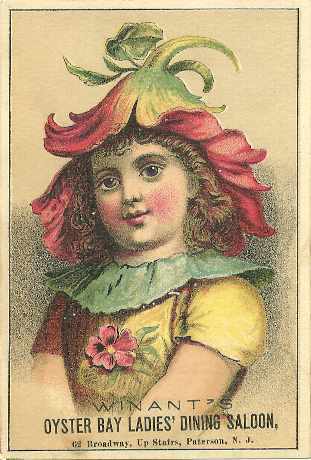 Front has Portrait of girl in hat, surrounded by flowers. 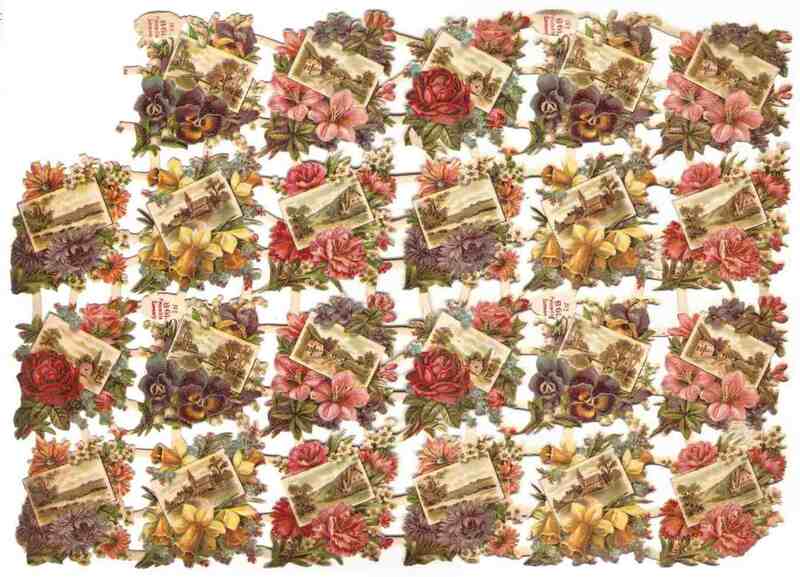 All on a blue bell background. 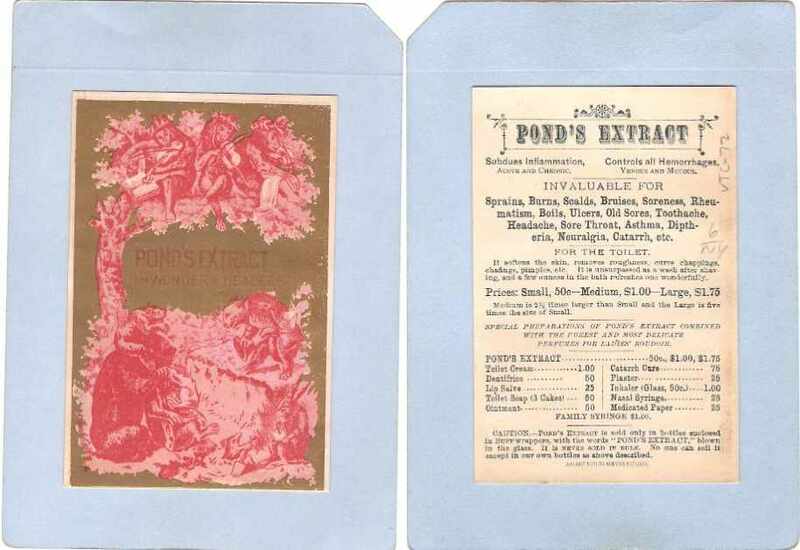 - Rear has advertising for Andrew's Pearl Baking powder. 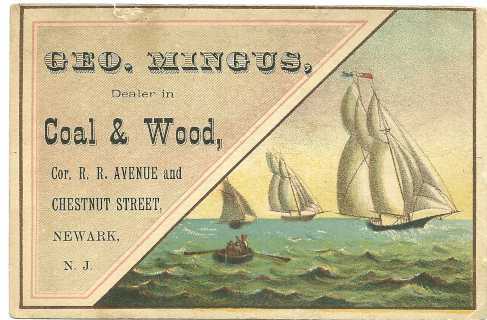 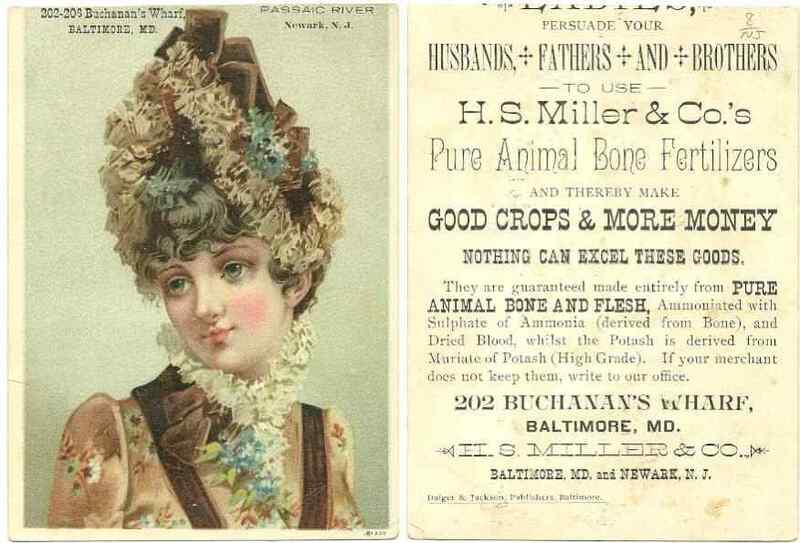 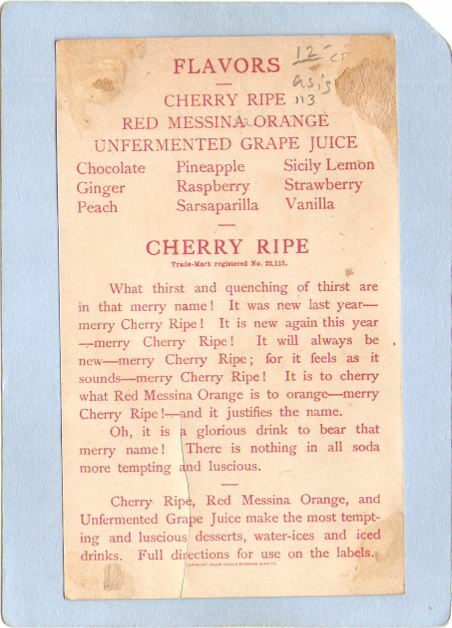 Manufacted by C. E. Andrews, 45 Michigan Avenue, Chigago, IL & 287, 289 and 291 East Water Street, Milwaukee, WI. 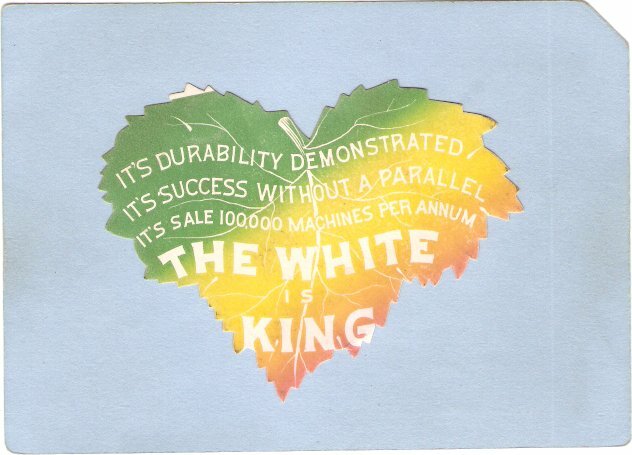 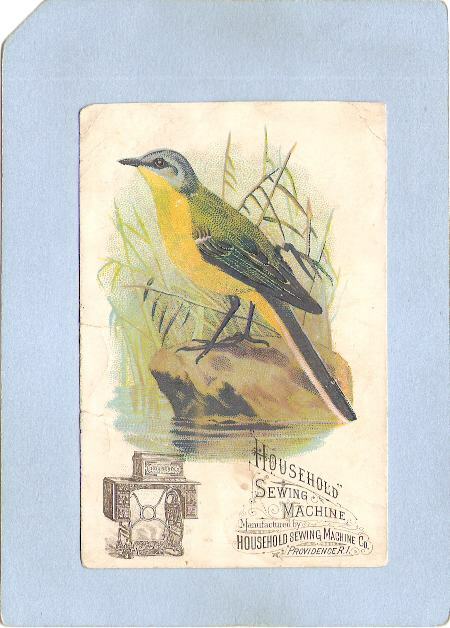 Advertisment for Wheeler & Wilson's New High Arm Family Sewing Machine - The No. 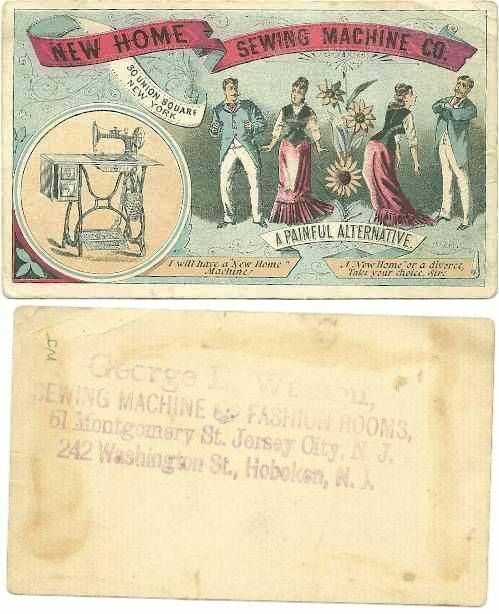 9 - Wheeler & Wilson's Factory and Chief Office - Bridgeport, Conn.
Front: Picture of sewing machine lower left corner - New Home Sewing Machine Co. banner across top - 30 Union Square, New York - Tow scenes of couples on either side of flower labeled A Painful Alternative - Choices being: I will Have A New Home Machine OR A New Home Or A Divorce, Your Choice Sir! 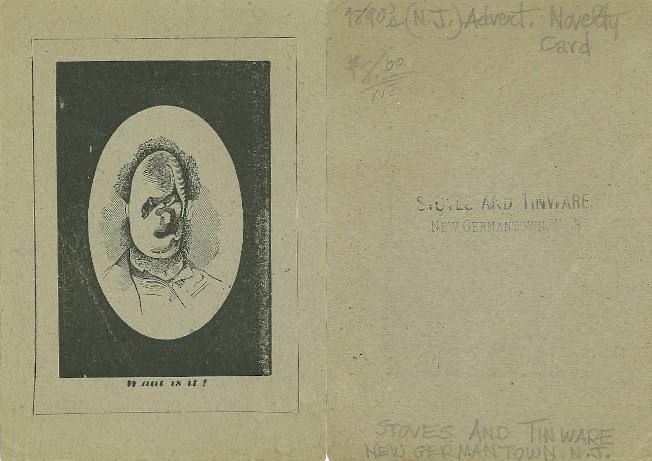 Portrait showing distroted face and whatever??? 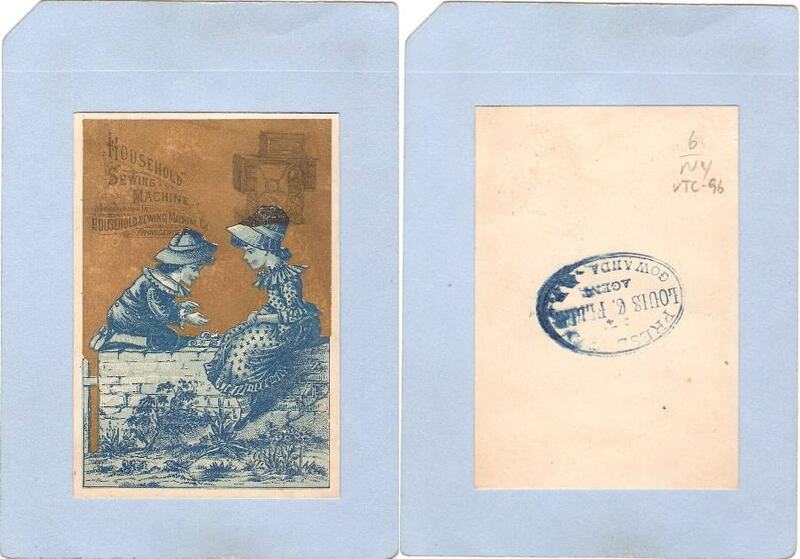 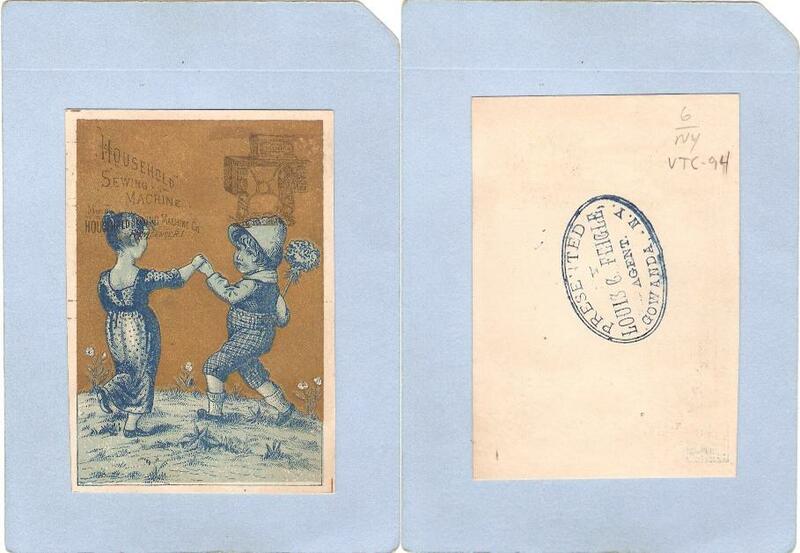 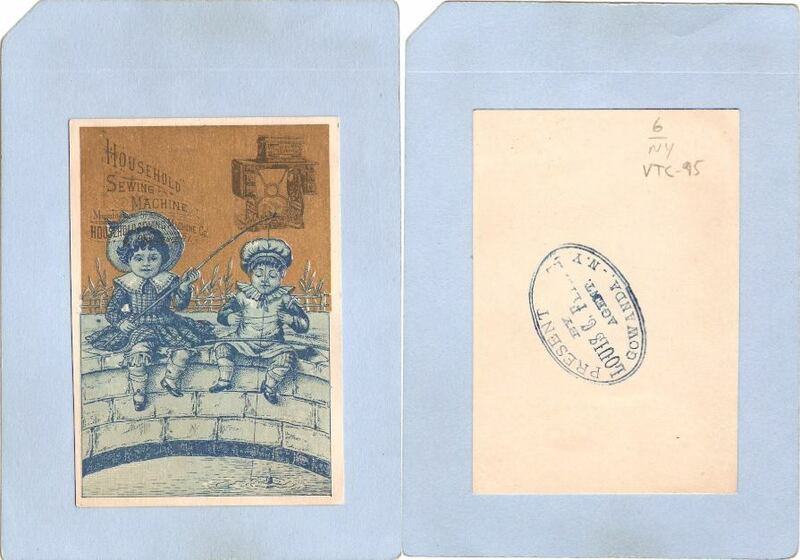 Front: Man and woman in victorin dress - Man tipping his hat and holding paper w/Edwin C. Burt, New York on it. 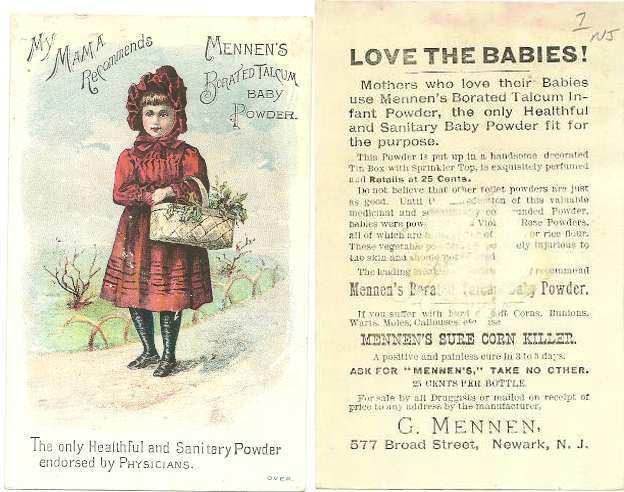 Advertisment of Menne's Baby Powder giving benifits of use. 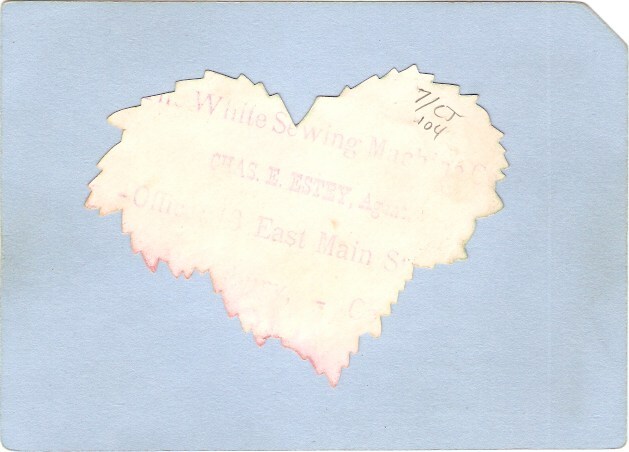 Small spot of glue residue in middle. 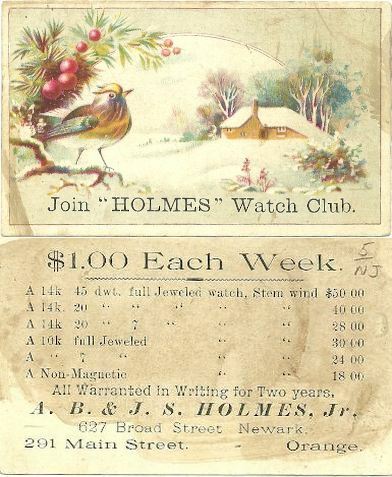 Front: Winter scene w/bird on branch and house in snow covered background - Join Holmes' Watch Club. 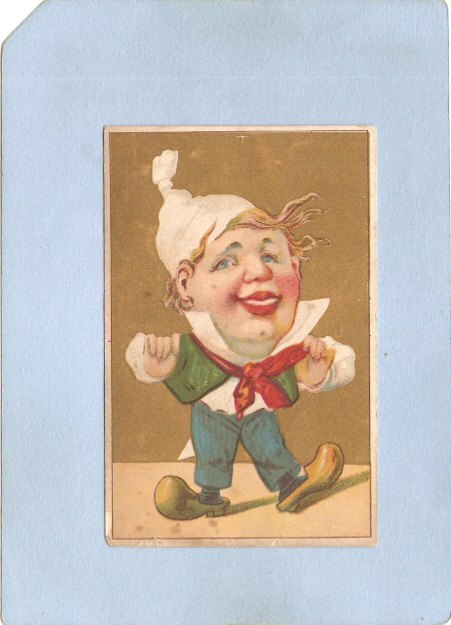 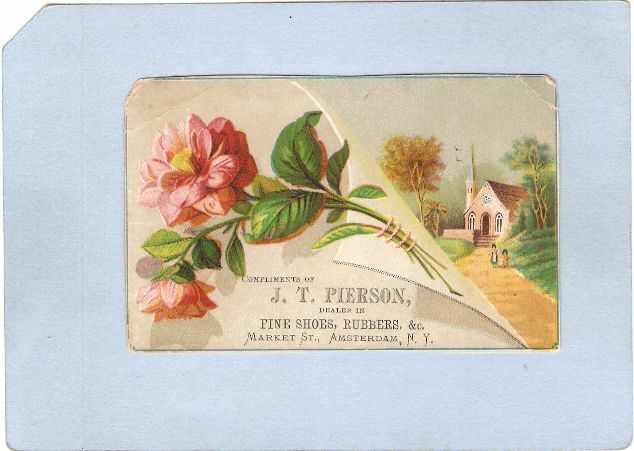 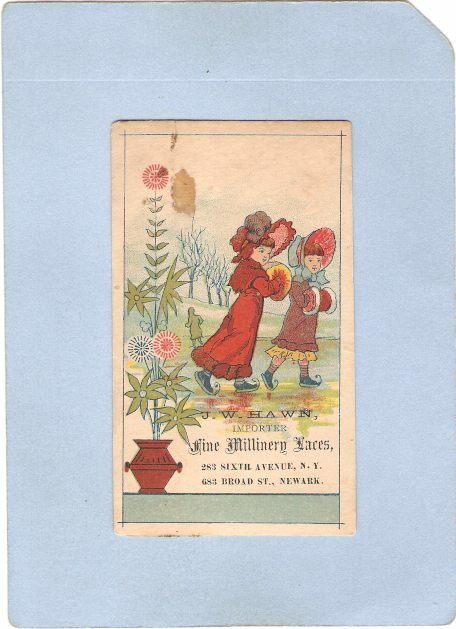 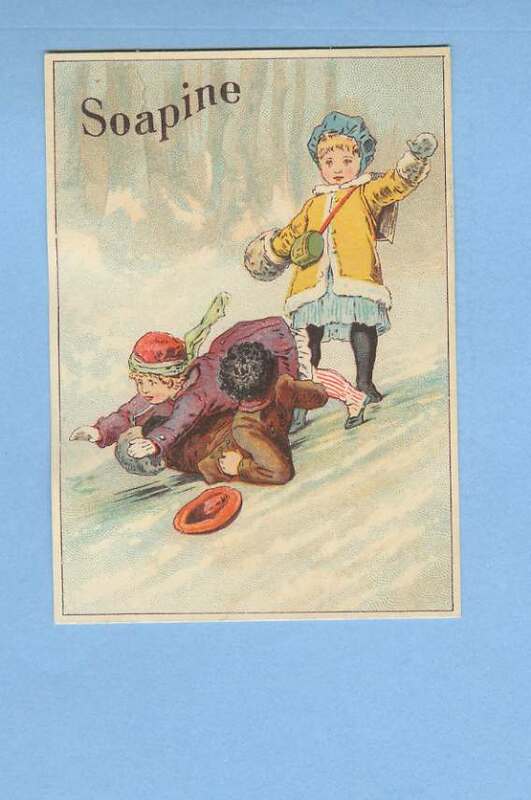 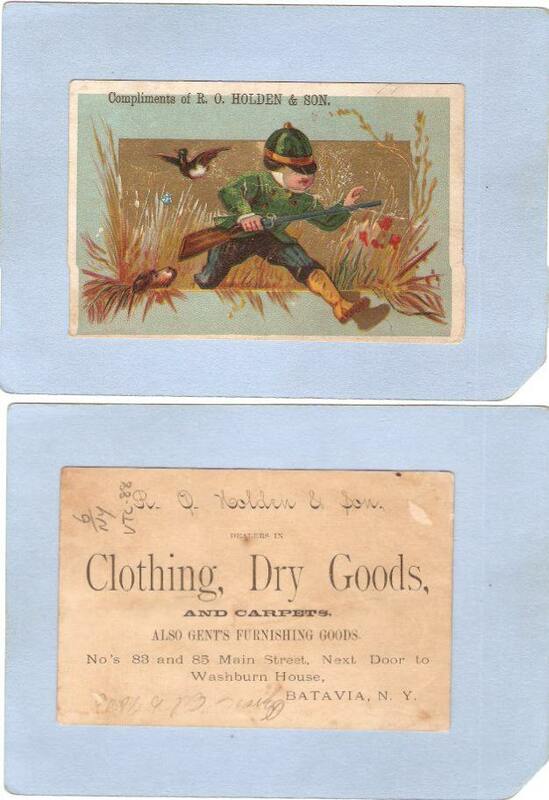 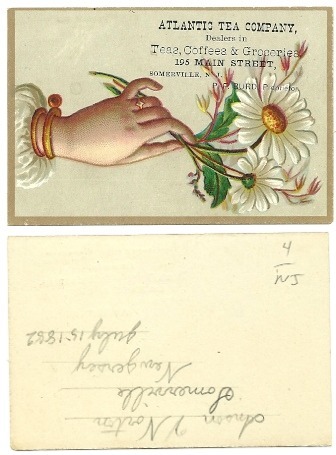 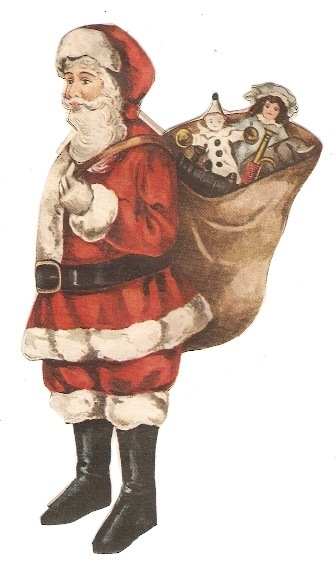 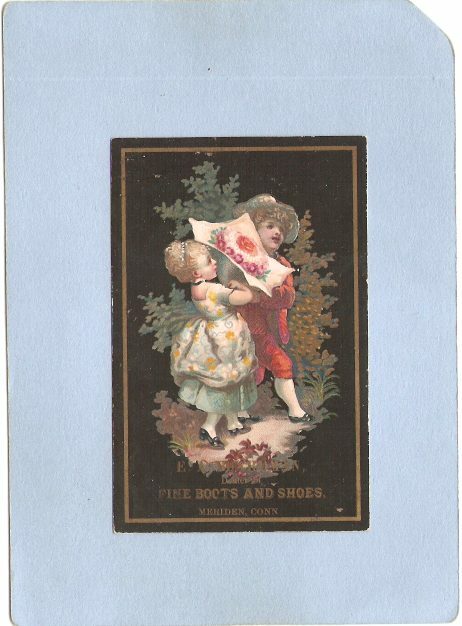 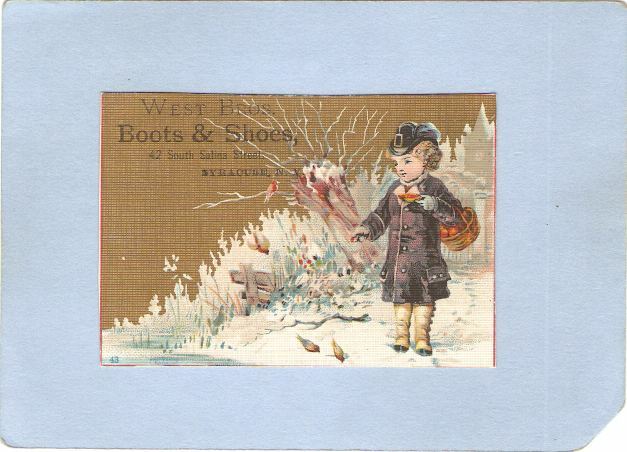 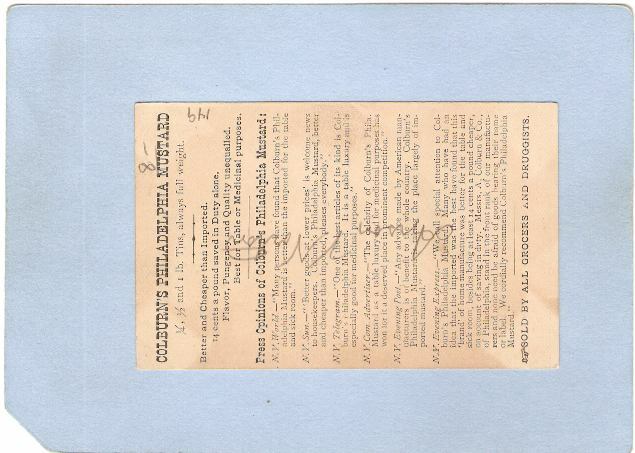 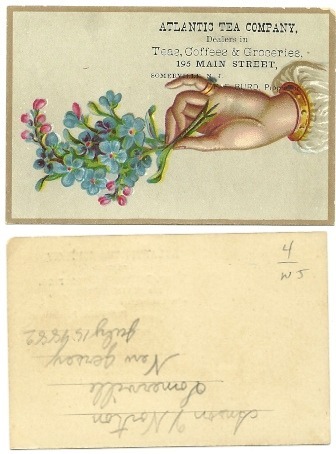 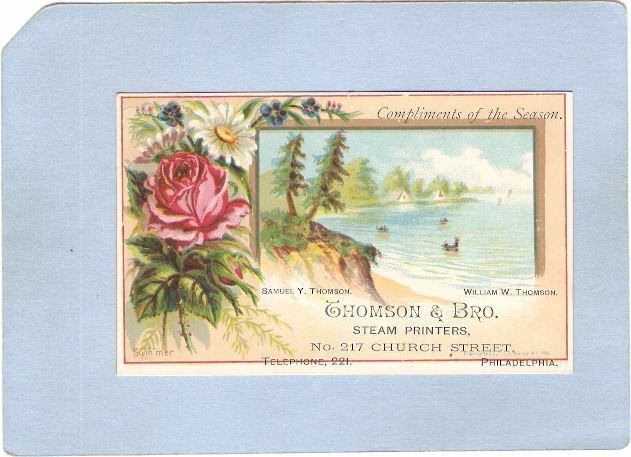 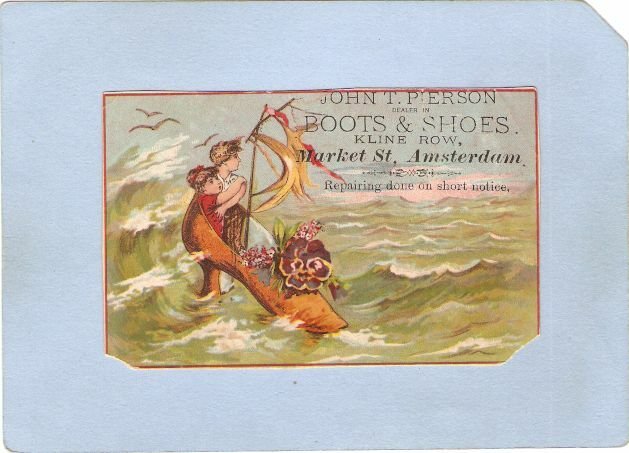 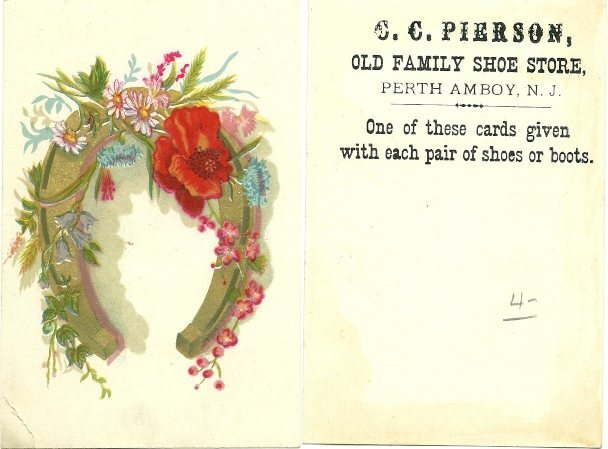 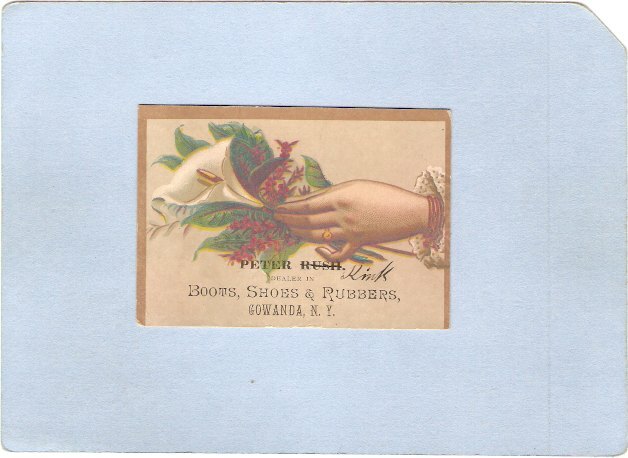 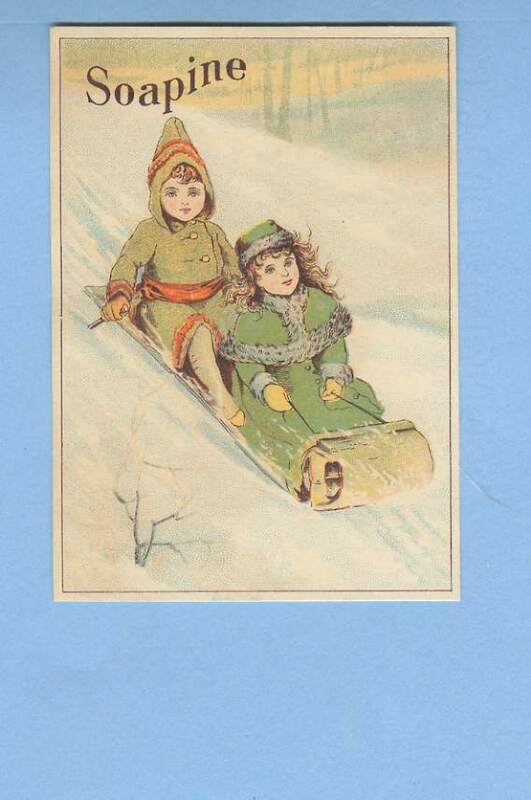 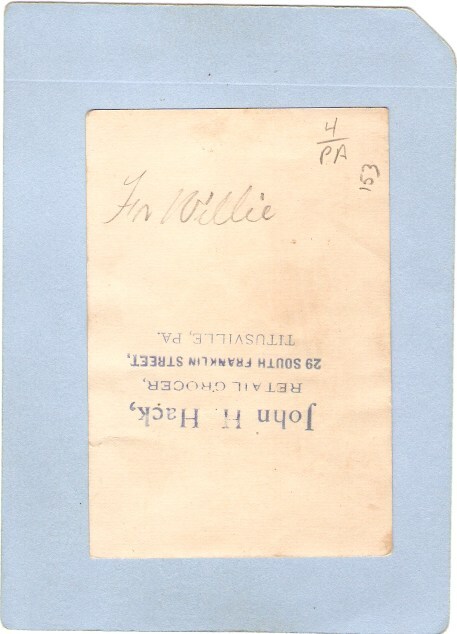 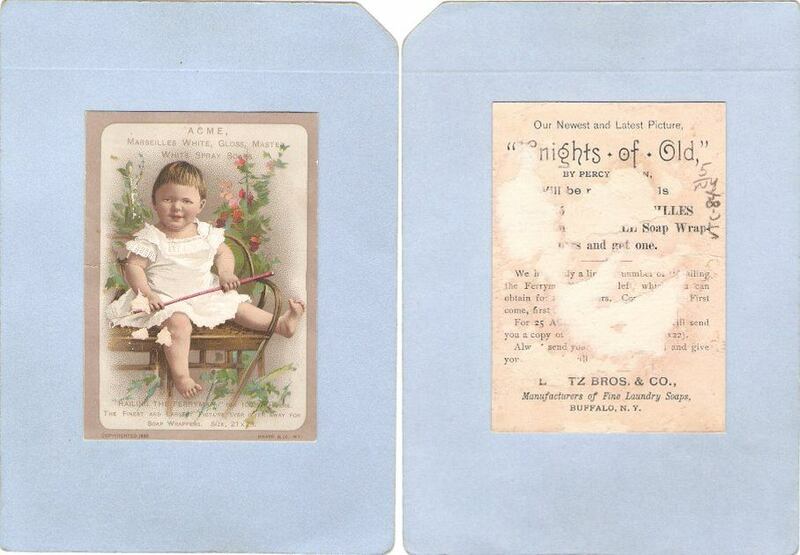 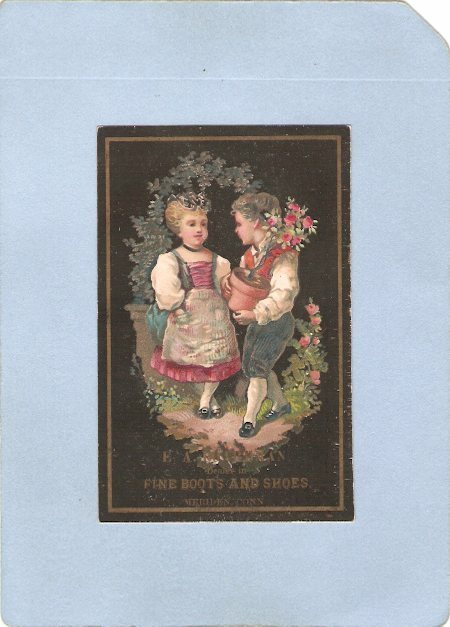 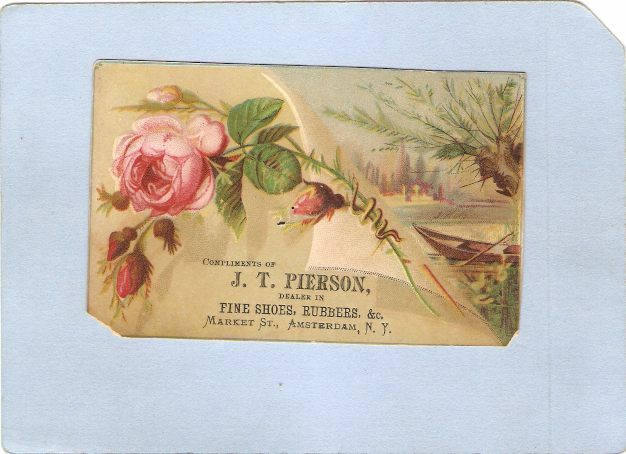 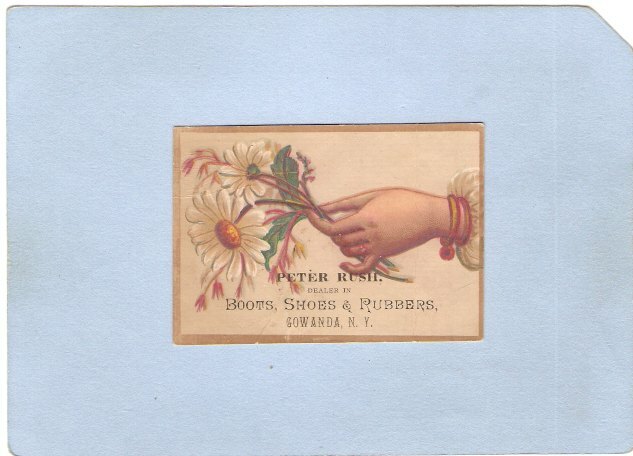 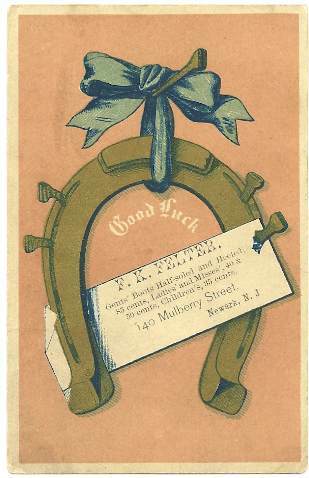 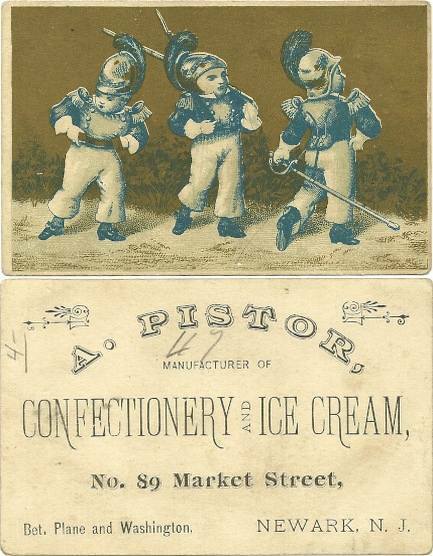 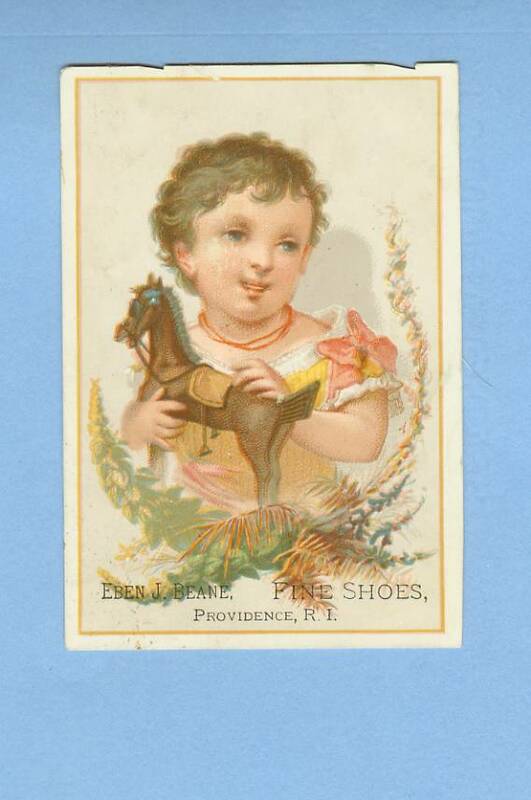 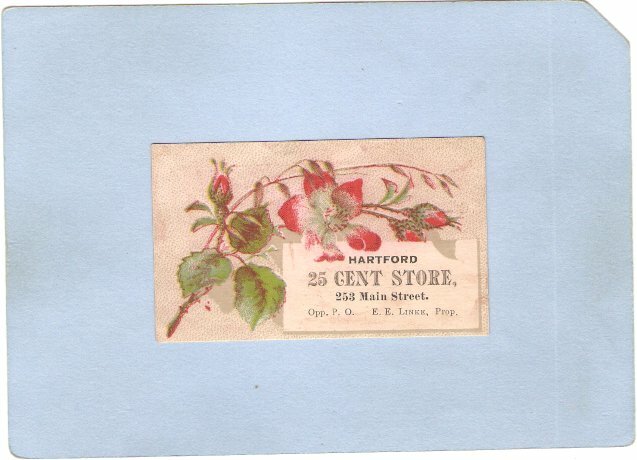 Rear: C. C. Pierson - Old Family Shoe Store - One of these cards given with each pair of shoes or boots. 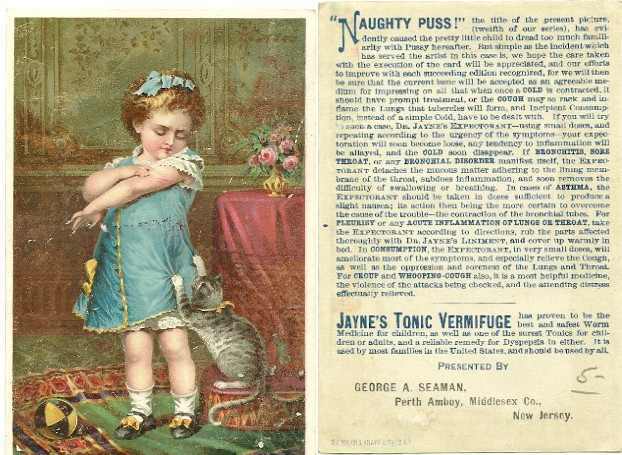 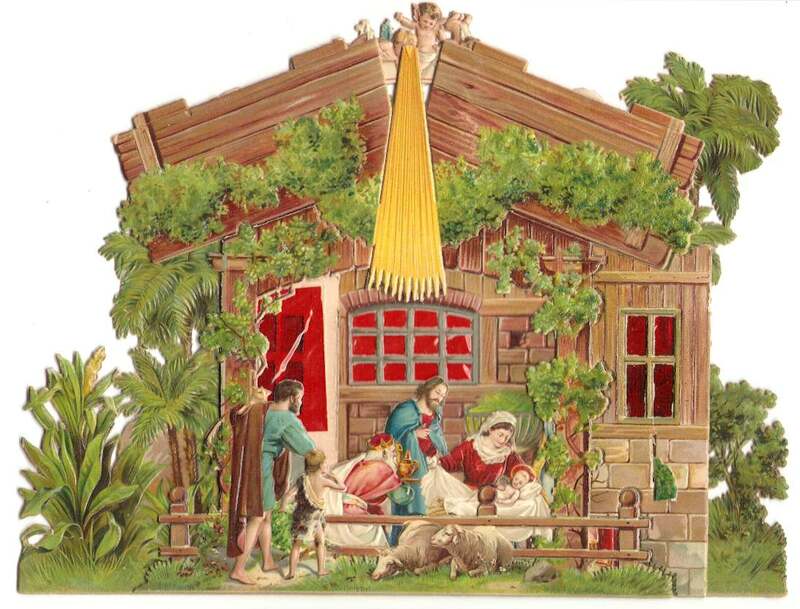 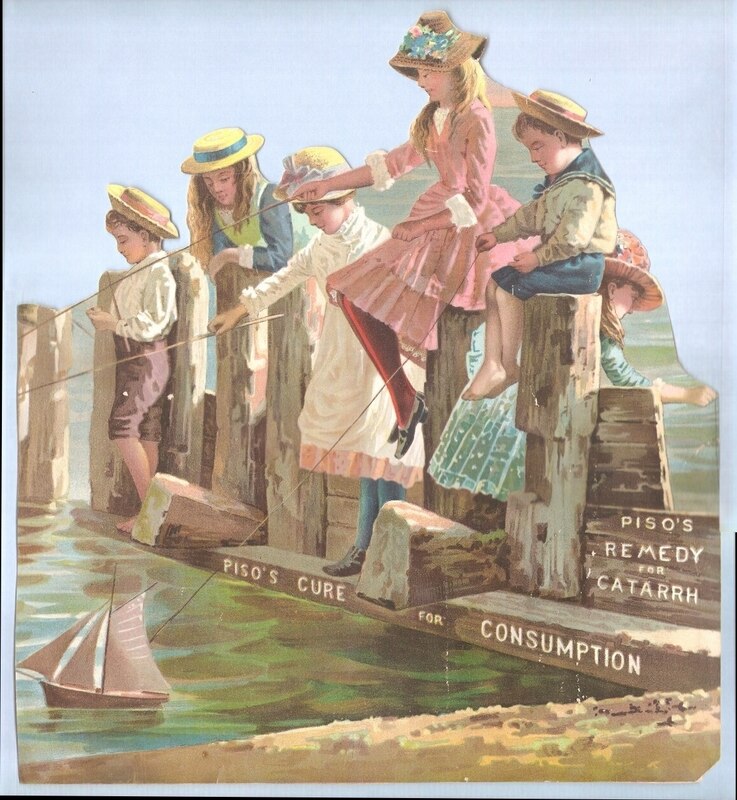 Rear: Adertisement for Jayn'e Tonic Vermifuge - Good for colds, consumption, croup, etc. 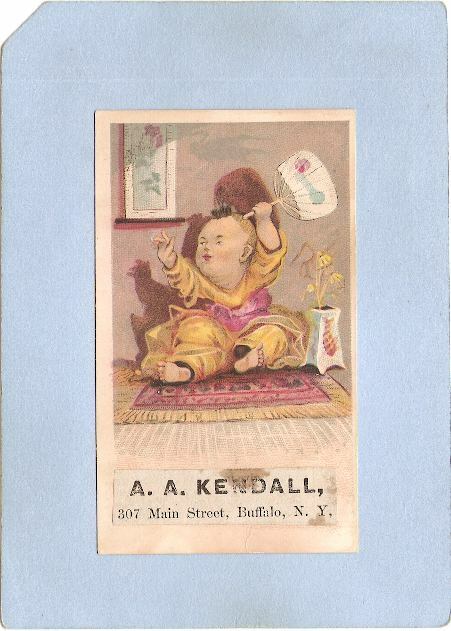 VTC-73 (NY) - Buffalo - Victorian Trade Card - J D L & Co.
Rear: Write-up on Andes Stoves and Ranges Manufactured By Phillips & Clark Stove Co.
VTC-150 (PA) - Bethlehem - Victorian Trade Card - Kleppinger Bros. - Challenge Incubator and Brooder Overall fine condition - may have minor faults, see scan for details County: Front: He may yet become president. 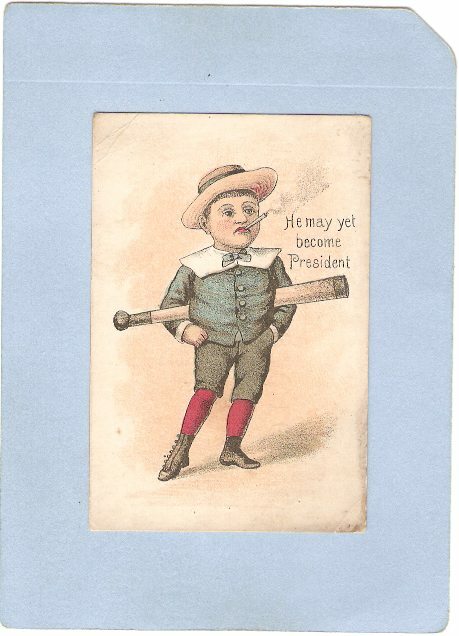 Drawing of boy holding a baseball bat and smoking a cigarette. 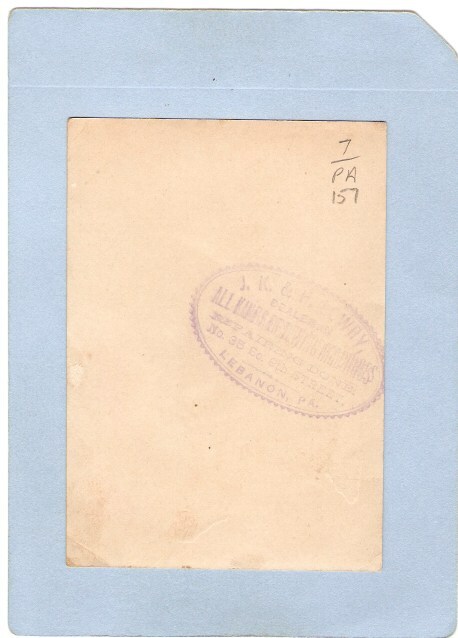 Rear: J. 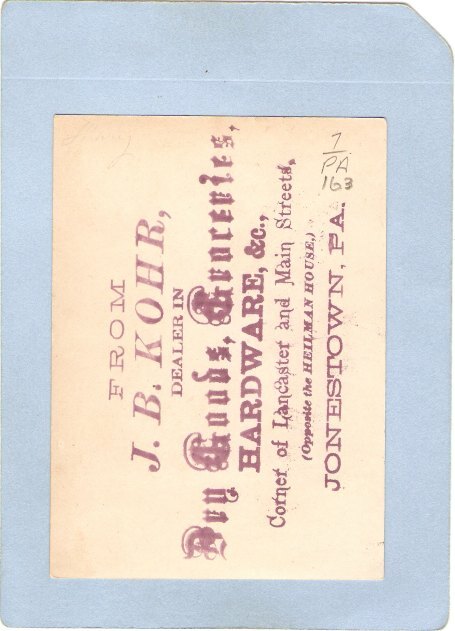 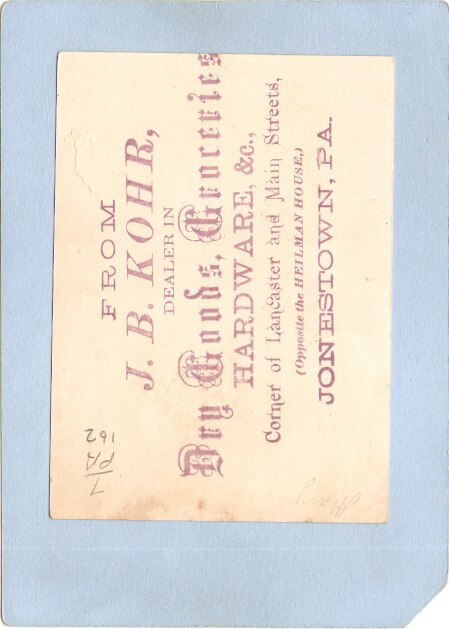 B. Kohr, Corner of Lancaster and Main Streets, (Opposite the Heilman House) Dealers in Dry Goods, Groceries, Hardware, &c.
DIECUT-5 (TOP) - Die Cut - Calendar - Partial Calendar showing the mouths of September, October, November, and December of 1898 - Appears to be similar to large victorian trade card Overall fine condition - minor patches of paper stuck to rear from glue mounting Rear has advertising for the advantages of life insurance. 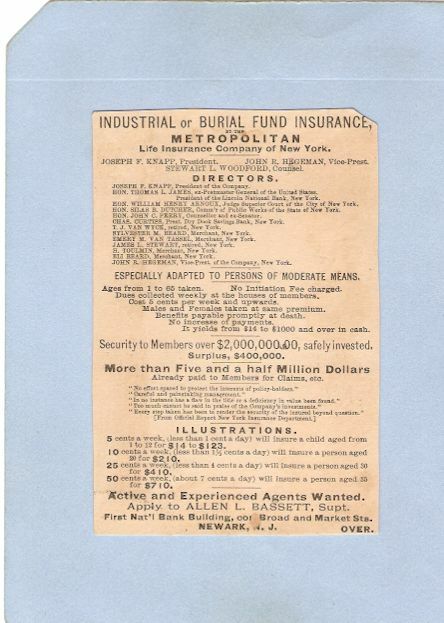 Equitable Life Assurance Society Of The United States, 120 Broadway, N.Y.